Tsunomure castle (角牟礼城) is located at Tsunomure mountain, one of 200 meter high from hillside at the north of Kusu basin. 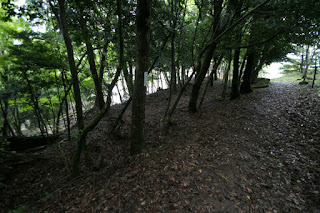 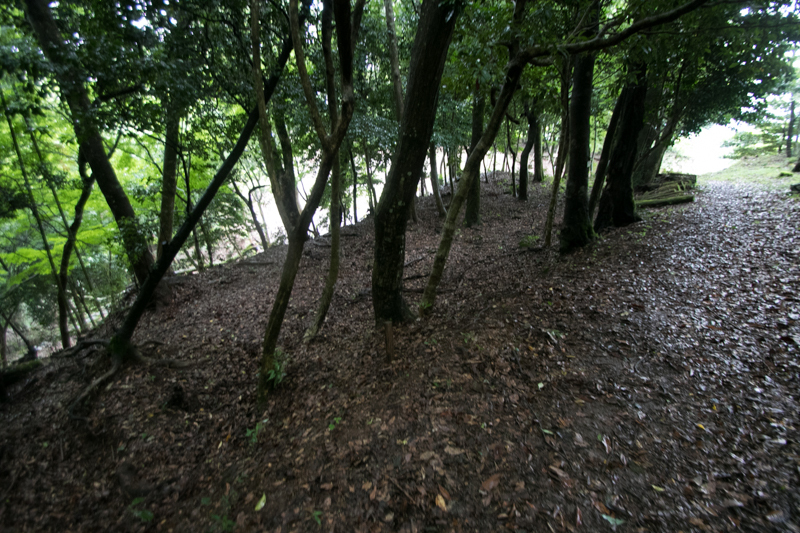 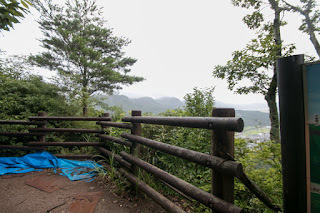 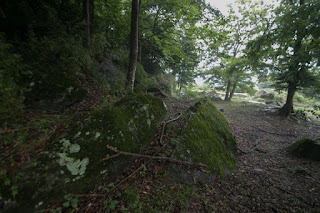 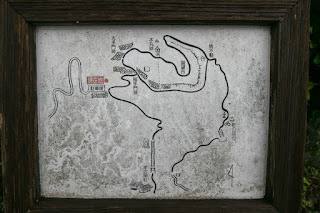 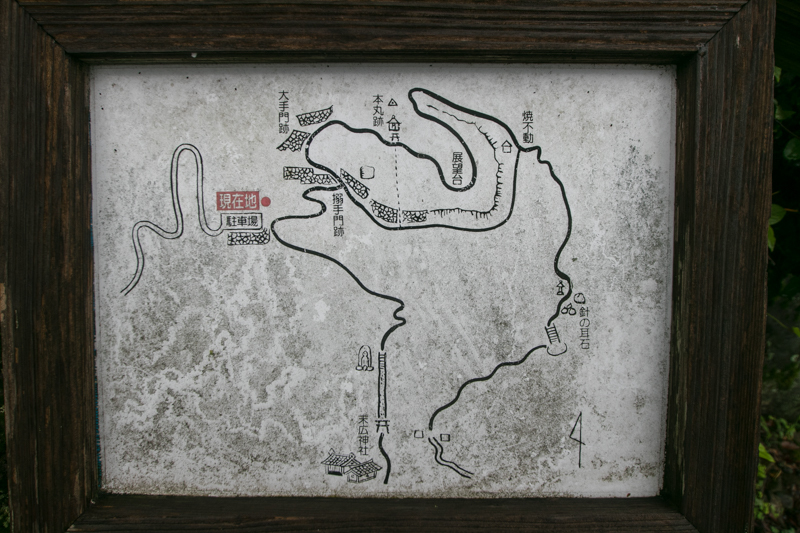 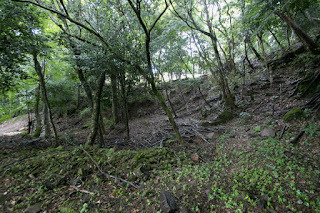 Kusu basin is a small basin along with the upstream of Chikugogawa river, a long river crosses north part of Kyushu island and has been used as an important road from Fukuoka area to Oita area the same now as of old. 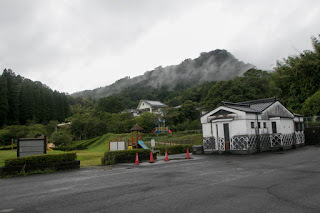 At the west of Kusu basin toward Fukuoka prefecture there is Hita area which is known as a direct governed territory of Edo Shogunate having traditional town, and ahead of the path toward Oita direction, there is Yufuin town famous for its spa. 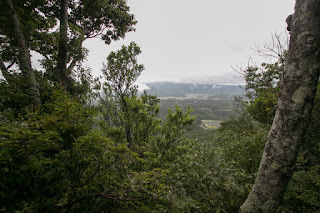 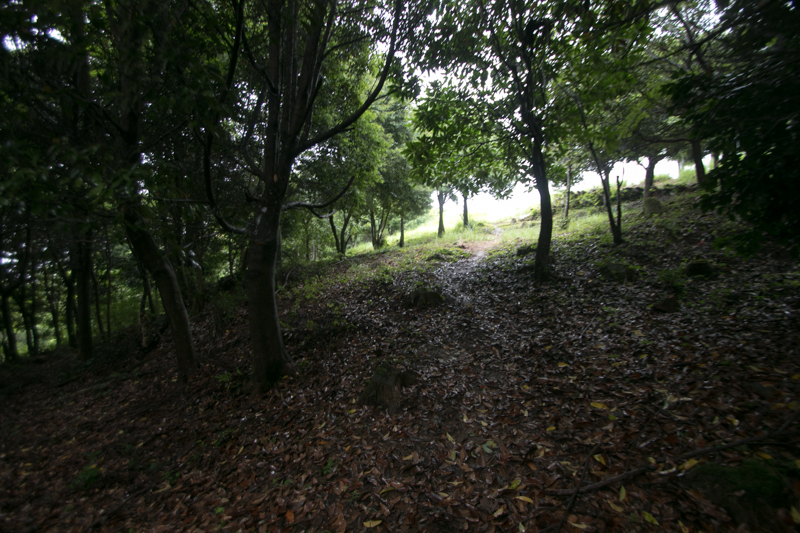 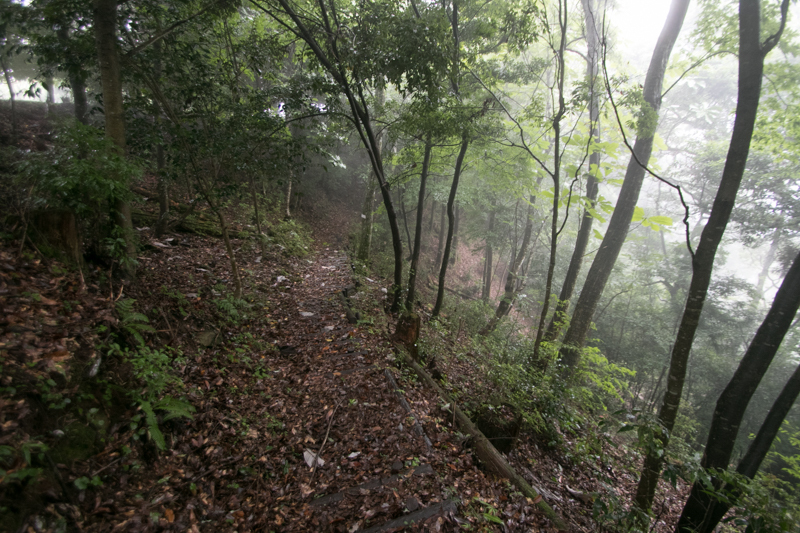 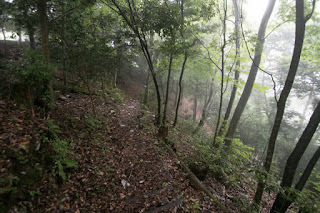 Tsunomure mountain is a independent peak soaring like a horn, being surrounded sheer slope for every direction. 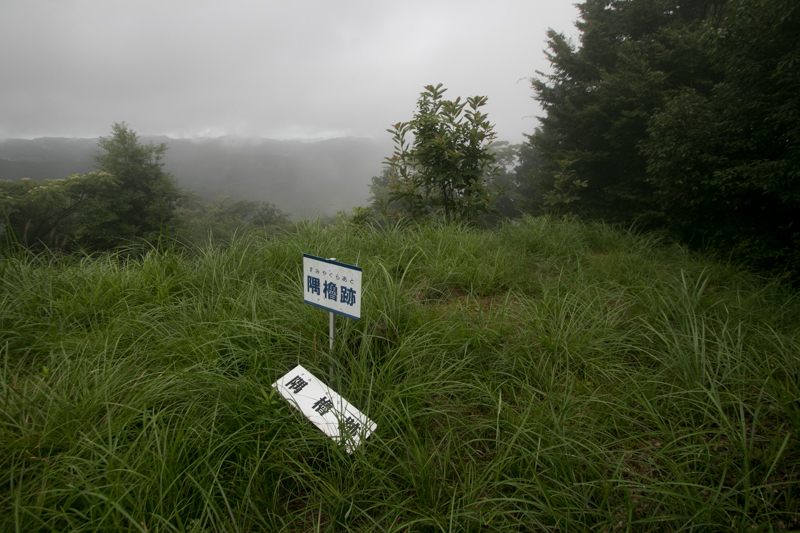 "Tsuno" and "Mure" mean horn and mountain respectively, thus the name itself is a horn like mountain. 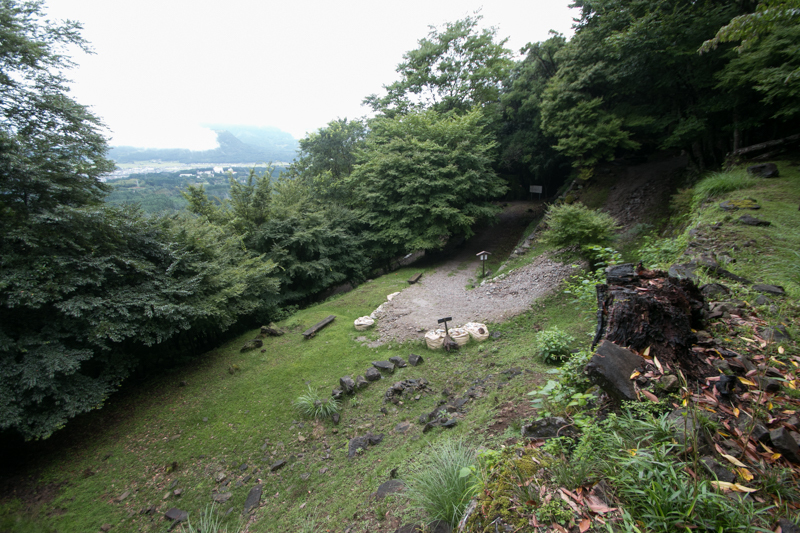 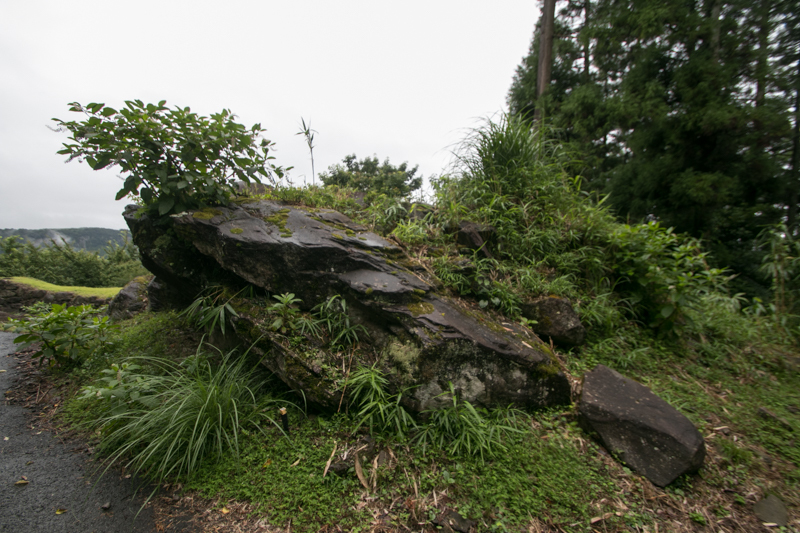 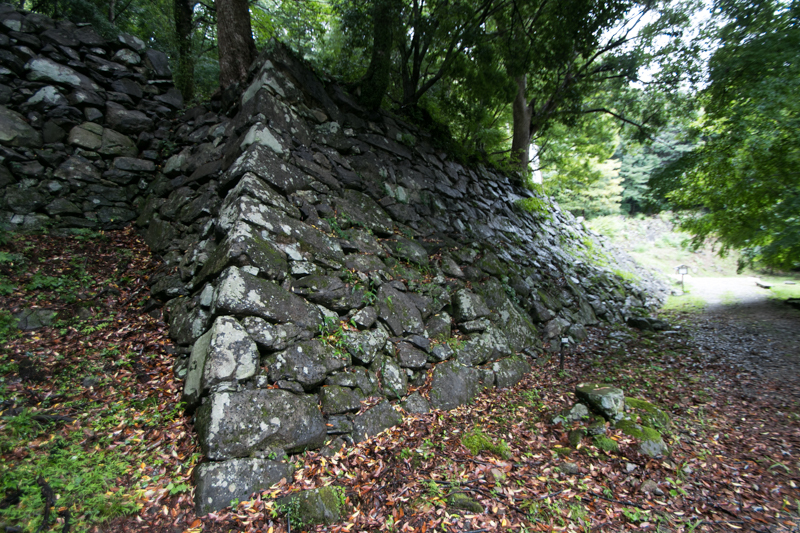 Because of its prominent shape Tsunomure mountain was a object to admire, and might be used as a place of mountainous temple. 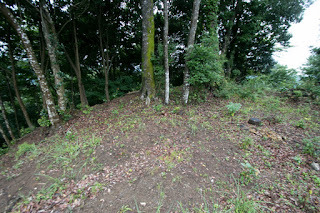 Too much separated terraces for castle might be the trace of former temple. 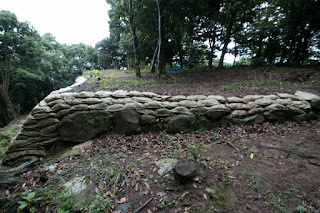 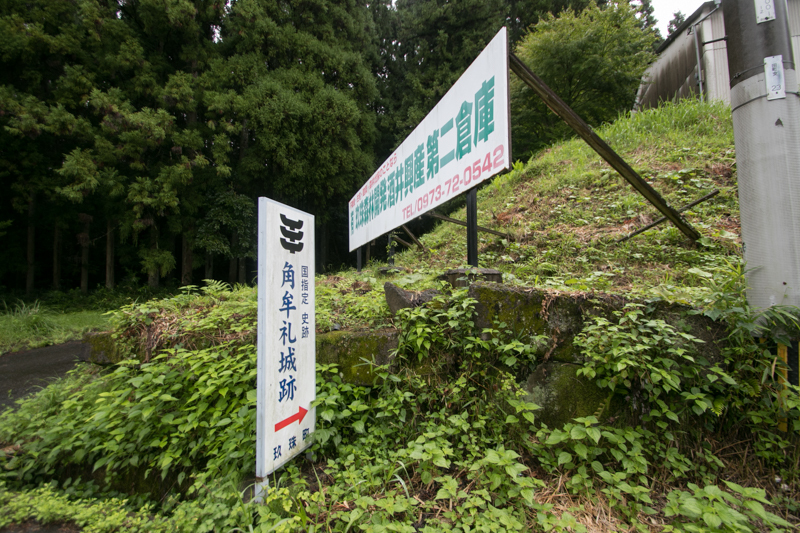 But in Muromachi era, Tsunomure mountain became used as a most forefront fort toward Fukuoka area by Otomo clan, the house of the governor of Bungo province (Oita prefecture). 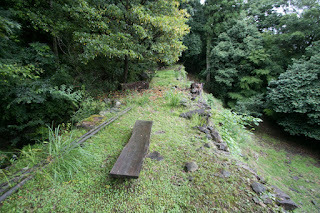 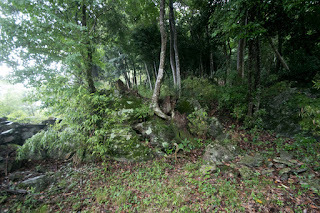 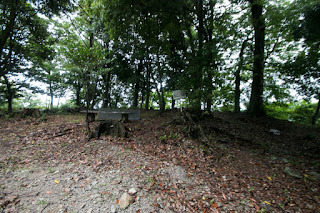 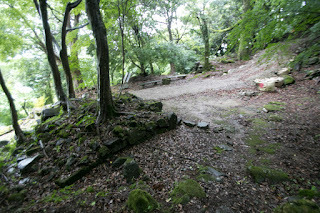 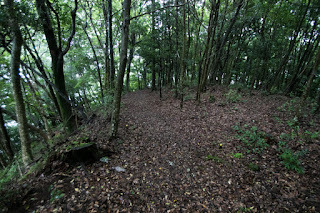 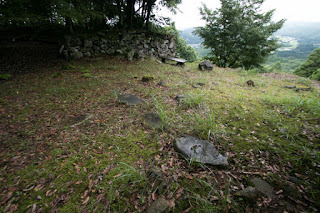 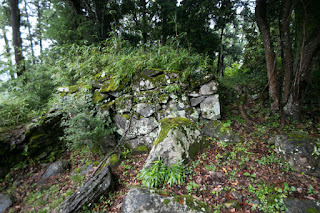 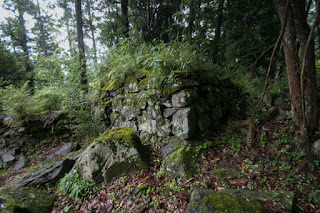 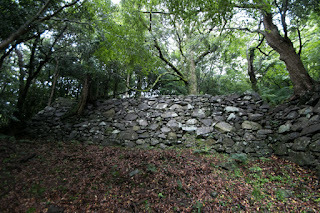 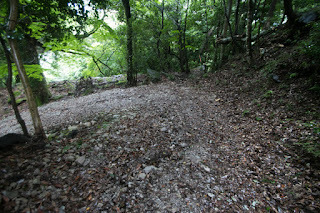 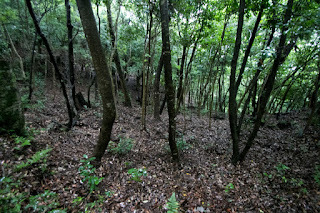 It is said that Tsunomure castle was built by Mori clan in 13th century but it is unknown if this story is true or not. As Otomo clan struggled against Ouchi clan, the strong warlord of Suo province (Yamaguchi prefecture) which held current Kitakyushu city and Fukuoka city, or Shoni clan which was another traditional house of the governor of Chikugo province (south half of Fukuoka prefecture), it might be necessary to stop the intrusion along Chikugogawa river or from Nakatsu area through Yabakei valley at this place. Anyway Otomo clan strengthened Tsunomure castle and let local small lords to guard it. In the middle of 16th century Otomo clan recited the supremacy to the north half of Kyushu island under its leader Yoshishige Otomo (1530-1587, known for his Buddhist name Sorin) who was the lord of Usuki castle (Oita prefecture). But since the defeat at the battle of Mimikawa in 1587, Otomo clan was overwhelmed by rising Shimazu clan which was the warlord of Satsuma province (Kagoshima prefecture) and rapidly fell. 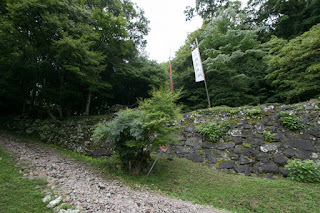 Shimazu clan beat Ryuzoji clan which was another strong lord of Hizen province (Saga prefecture) at the battle of Okitanawate in 1584, and finally made total attack toward Otomo clan in 1586. 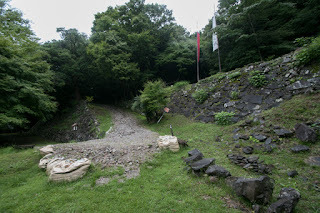 Main army of Shimazu clan lead by Yoshihiro Shimazu (1535-1619) marched from Higo province (Kumamoto prefecture) with 30,000 soldiers, and detached force commanded by Iehisa Shimazu (1547-1587) approached from Hyuga province (Miyazaki prefecture). 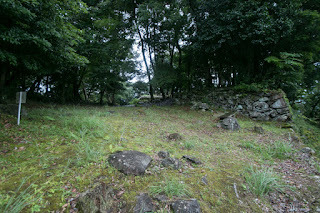 Otomo clan lost its power because of continuous betrayal of retainers, and before overwhelming army of Shimazu clan, plain area of the province was easily occupied. 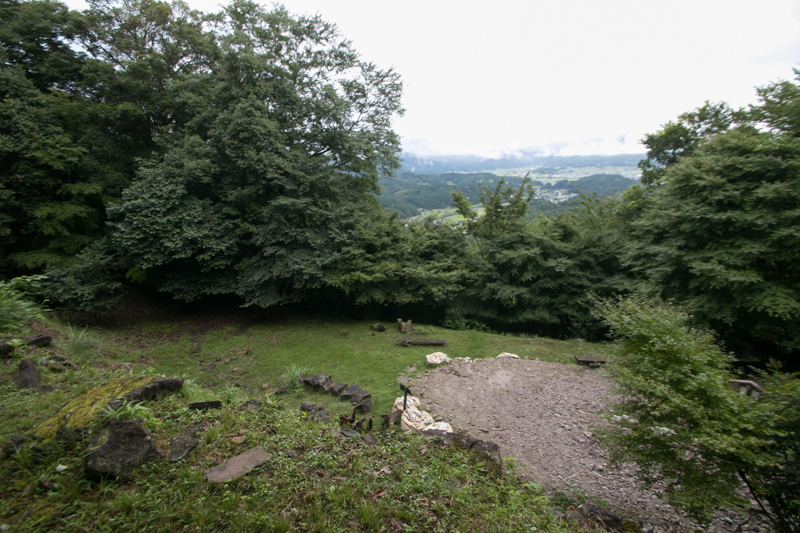 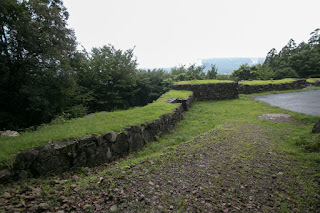 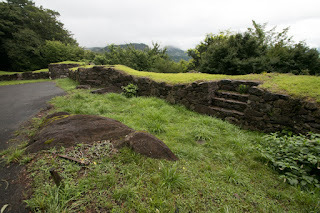 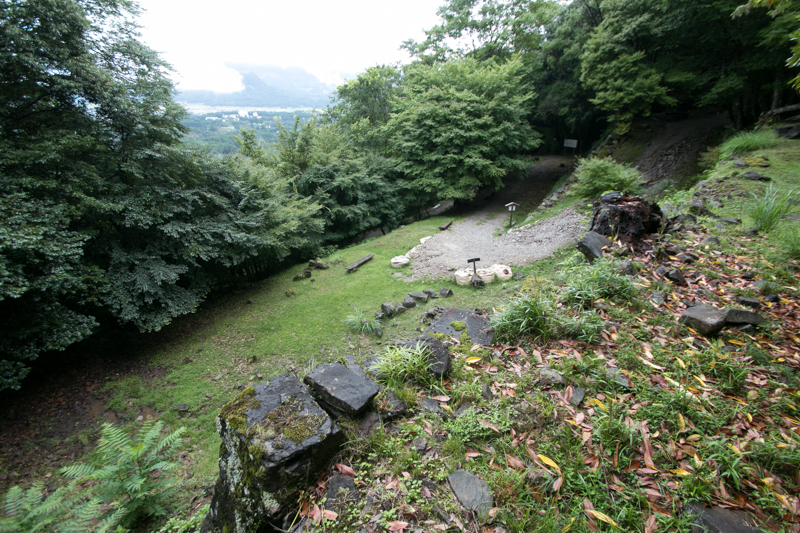 But several mountain castles such as Oka castle, Saeki castle or Usuki castle well stood against fierce attack of Shimazu army under the command of brave general. Especially, Chikatsugu Shiga (1566-1660) who was the commander of Oka castle broke Shimazu army with small army by guerrilla tactics. Yoshihiro Shimazu gave up the capture of Oka castle and proceeded the siege of surrounding castles. 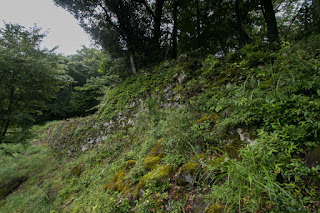 Shimazu army lead by its brave general Tadamoto Niiro (1526-1611) attacked Yamano castle, the one at the north of Oka castle protected by old general Akiyasu Kutami (1502-1586). Akiyasu resisted against Shimazu army but was over 80 year old and died from overwork, thus Yamano castle surrendered to Shimazu army. 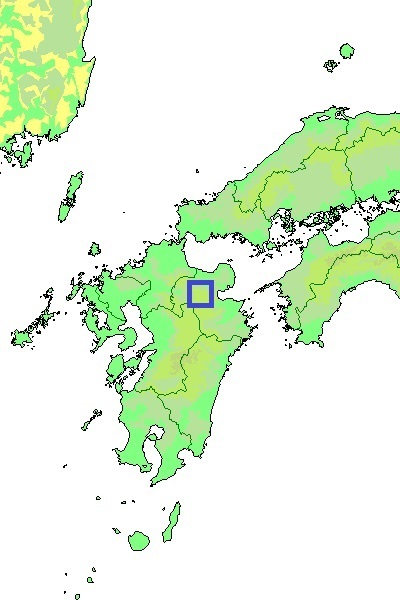 Next Tadamoto Niiro move further northward and entered into Kuru providence. This might be done to fix the backward to advance Oita plain, and make connection with following lords such as Akizuki clan. Shimazu army fell several castles of the area, but small local lords called as Kusu-syu besieged at Tsunomure castle which was the main castle of the area. Shimazu army encircled Tsunomure castle by 6,000 soldier. 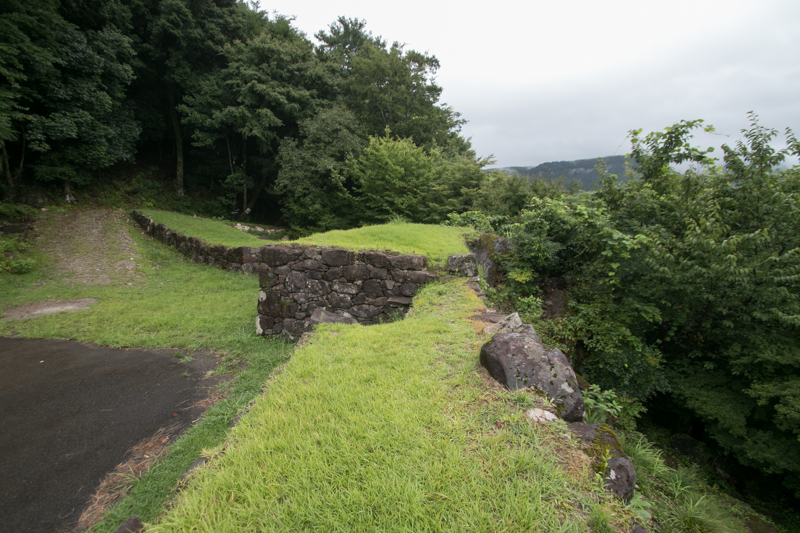 But only 1,000 soldiers lead by commander Gorozaemon Mori securely guarded the castle and drove back continuous attack of Shimazu army. 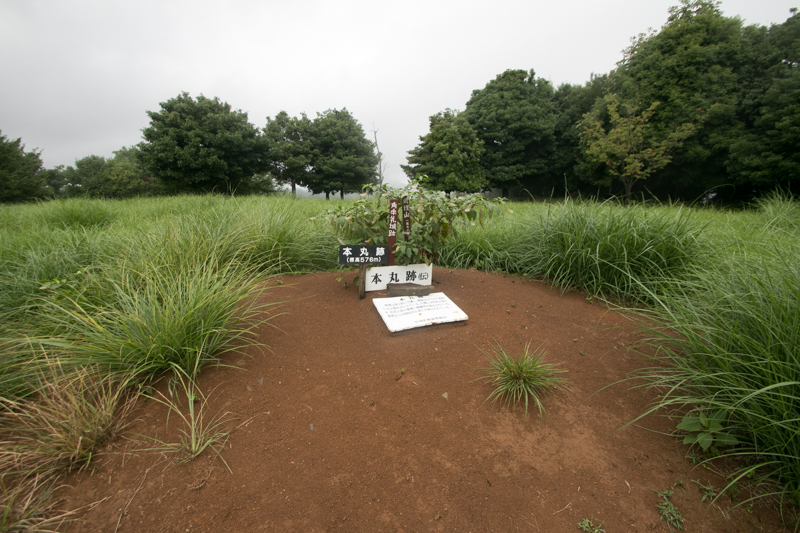 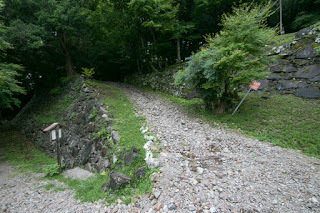 Once Shimazu army approached to third area, but was rejected by an excellent archer Geki Sukuri. 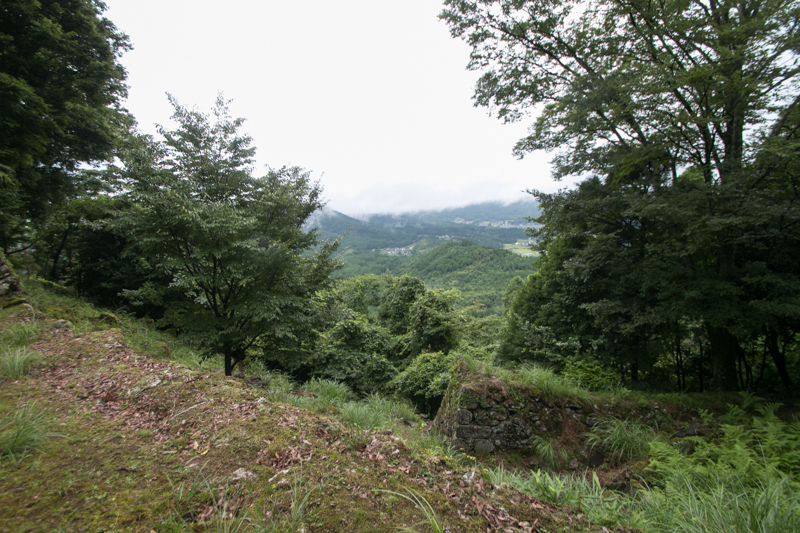 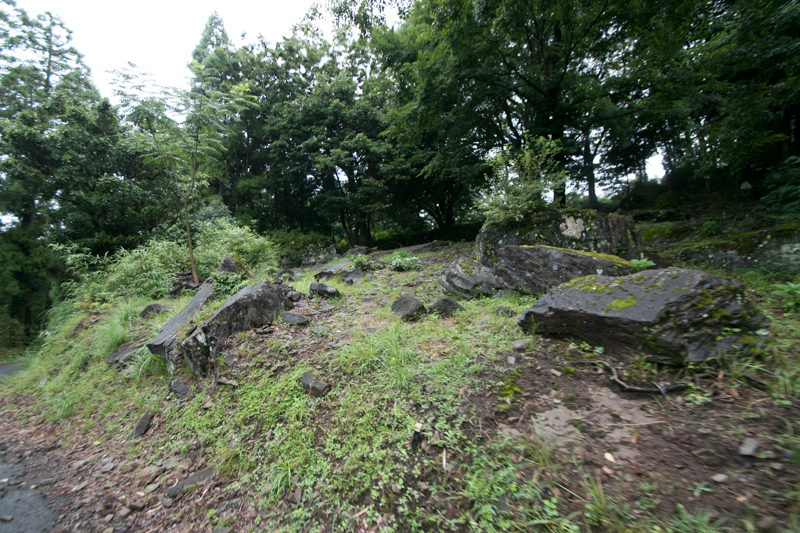 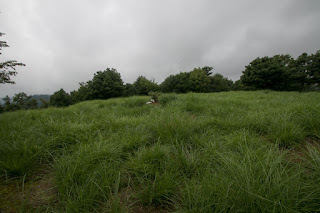 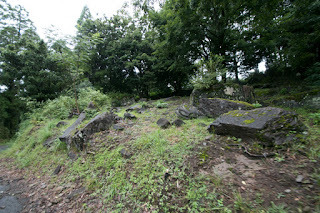 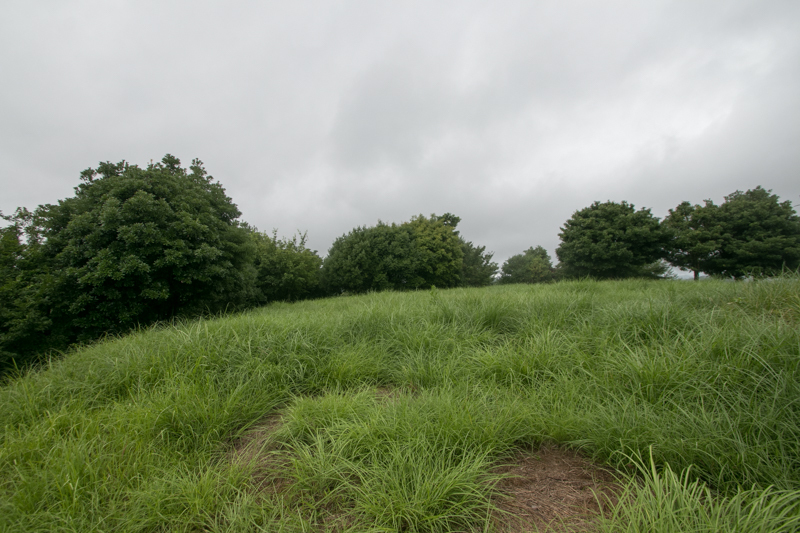 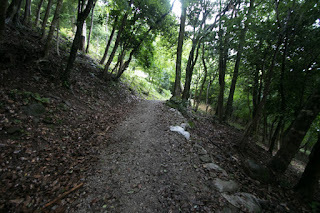 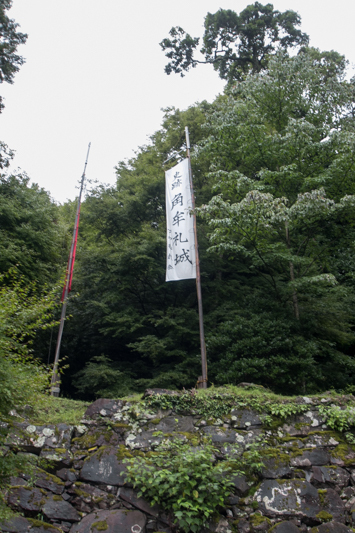 Shimazu army once retreated from the castle and headed to Hijyu castle at neighbor place. 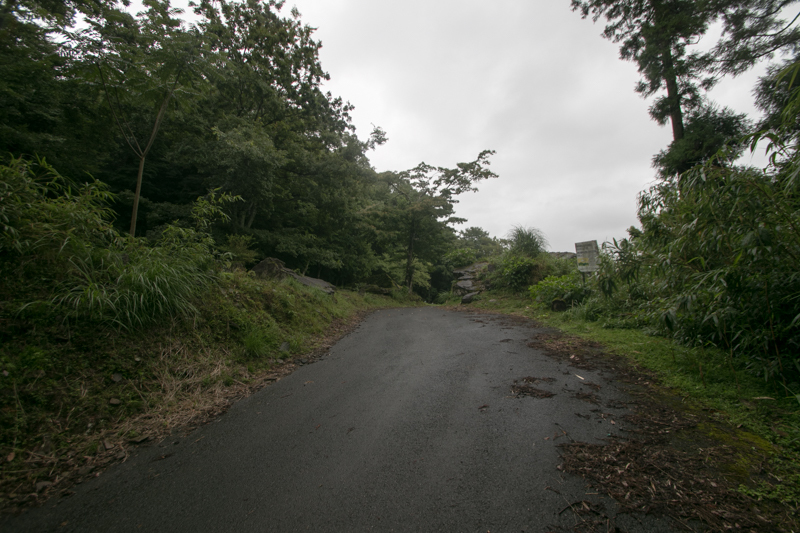 But Akinao Hoashi (?-? ), an important retainer of Otomo clan and marital relative of Mori clan at Tsunomure castle, assaulted Shimazu army stayed at the next of Hijyu castle along with his wife Oni-goze, and broke them then Tadamoto Niiro got injured and retreated. 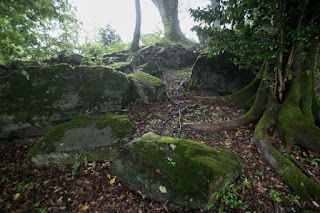 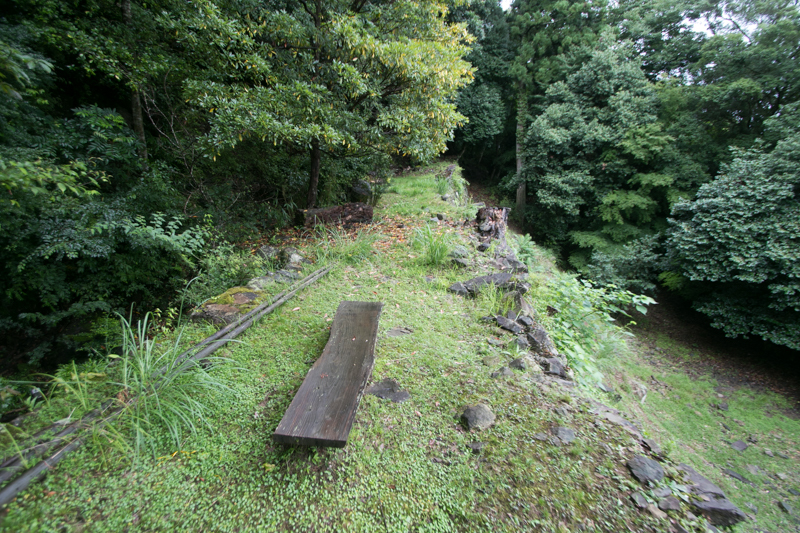 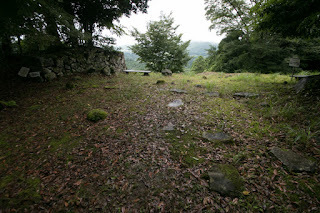 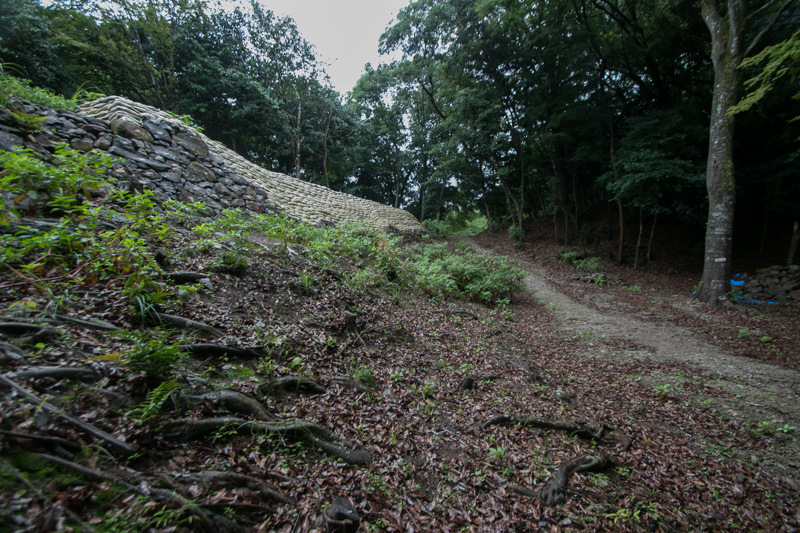 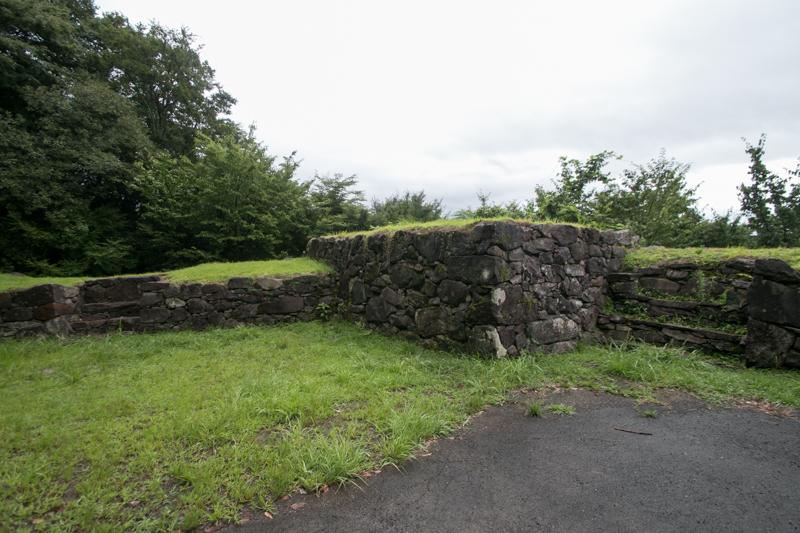 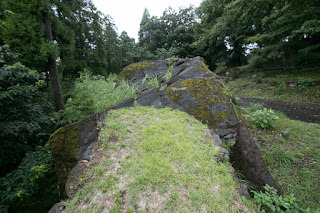 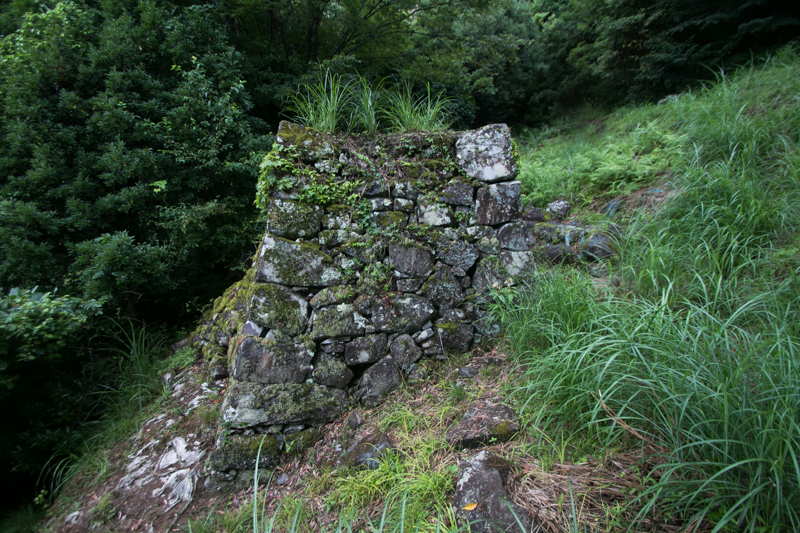 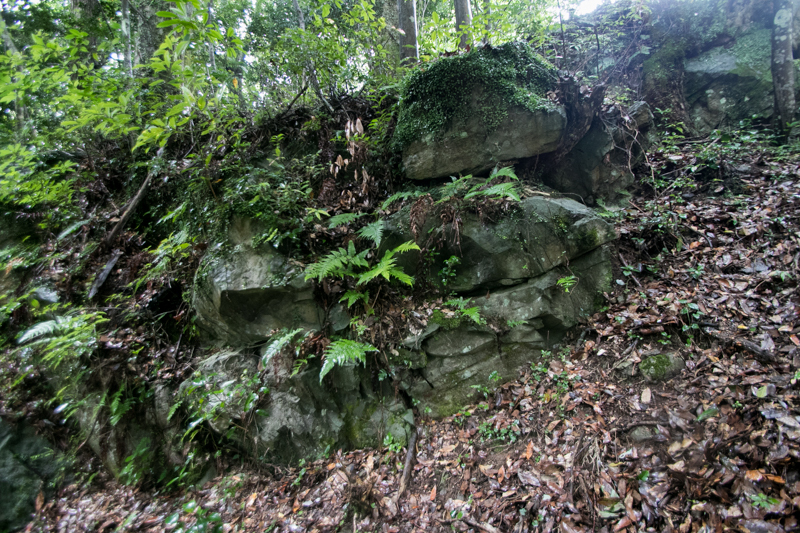 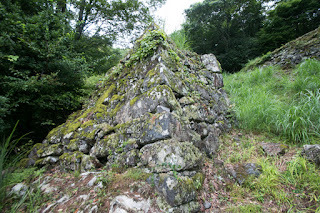 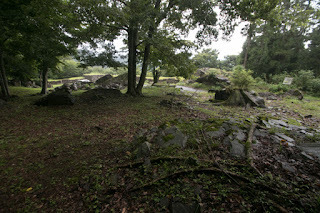 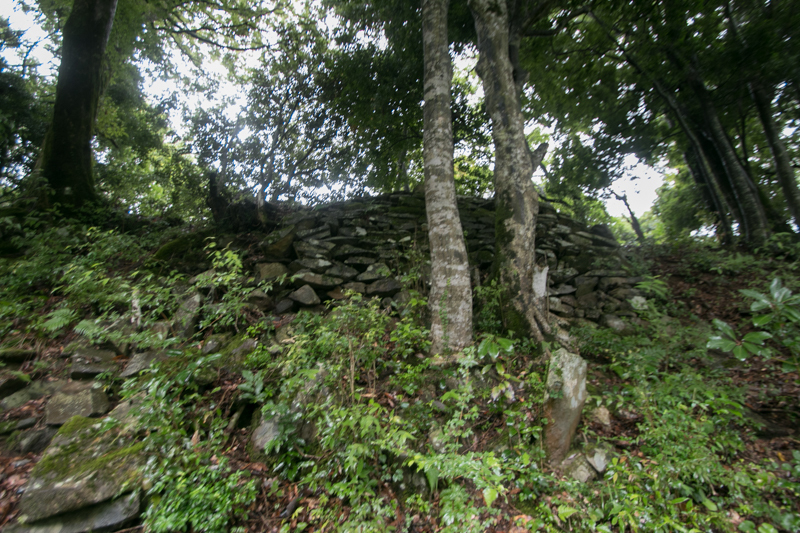 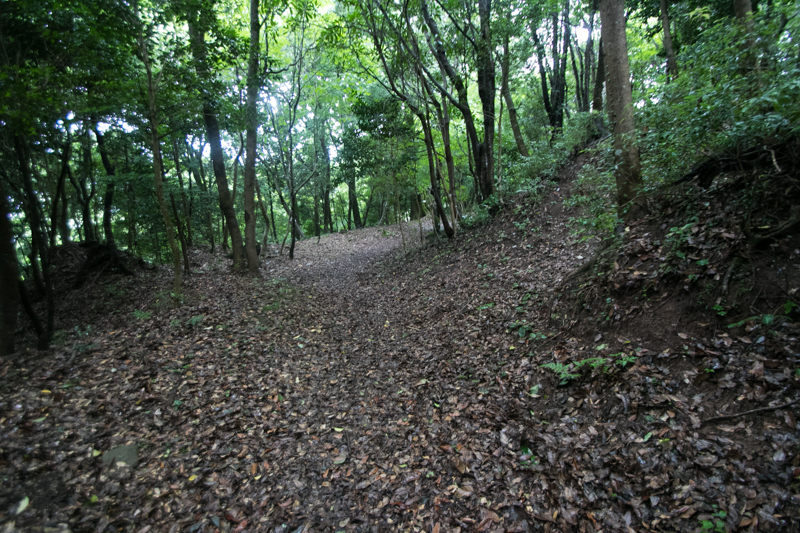 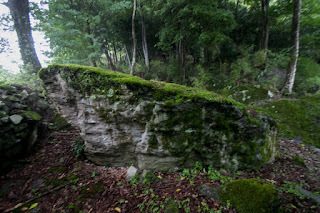 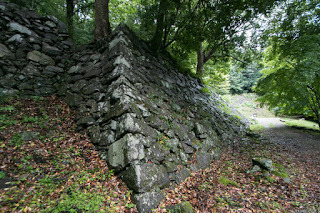 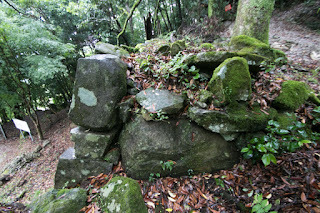 Tsunomure castle might be a horn that motivated Otomo army against strong enemy. 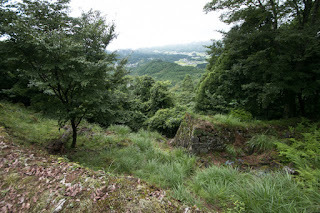 But in 1993, Otomo clan was expelled by Hideyoshi being blamed for the failure in the foreign expedition, and Tsunomure castle was also confiscated. Kusu area became the direct territory of Hideyoshi along with Hita area, and Tsunomure castle was given to Takamasa Mouri (1559-1629) who was the magistrate of Hideyoshi and lord of Saiki castle. 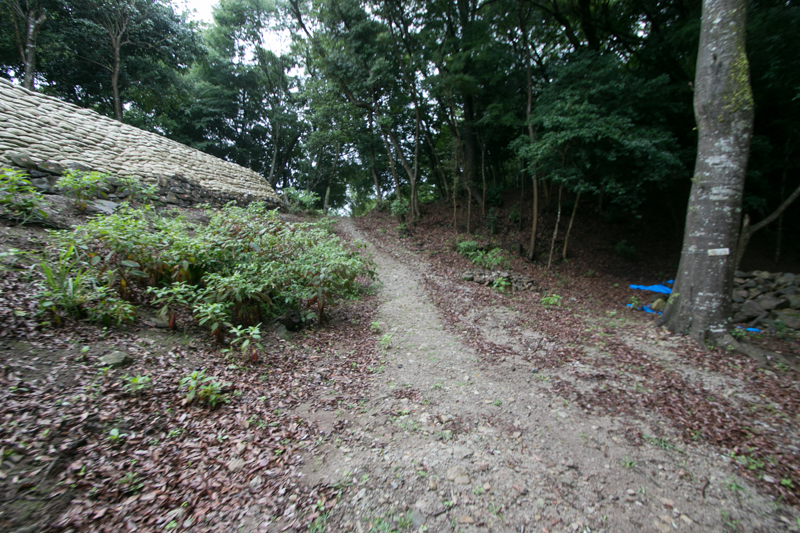 As Takamasa resided Hikuma castle at Hita area separated by mountains from Kusu area, thus he reformed Tsunomure castle into a modern one to use as a base at Kusu area. Because of military service and limited budget, it seems Mouri clan gradually reformed this castle from upper part to lower part. 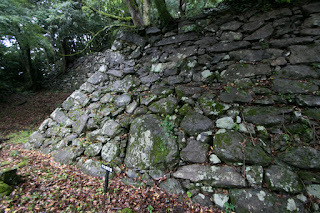 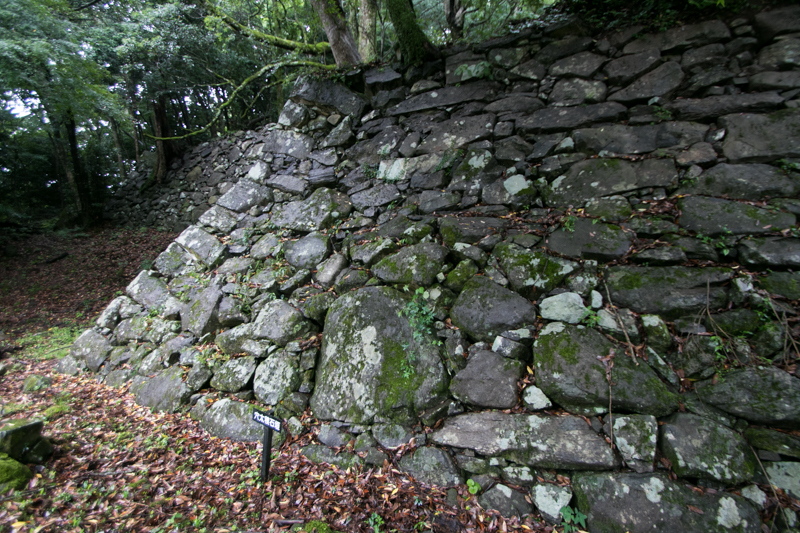 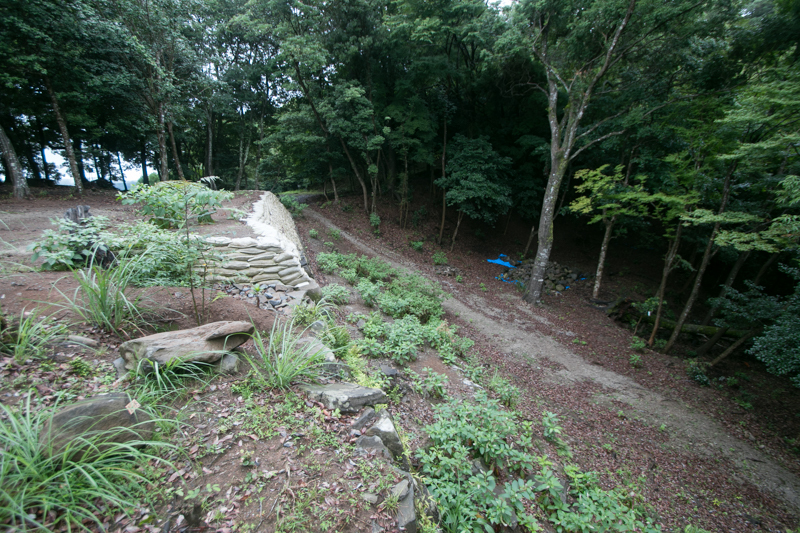 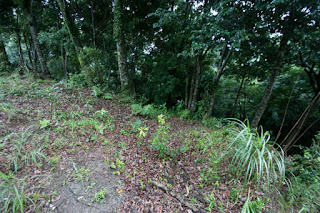 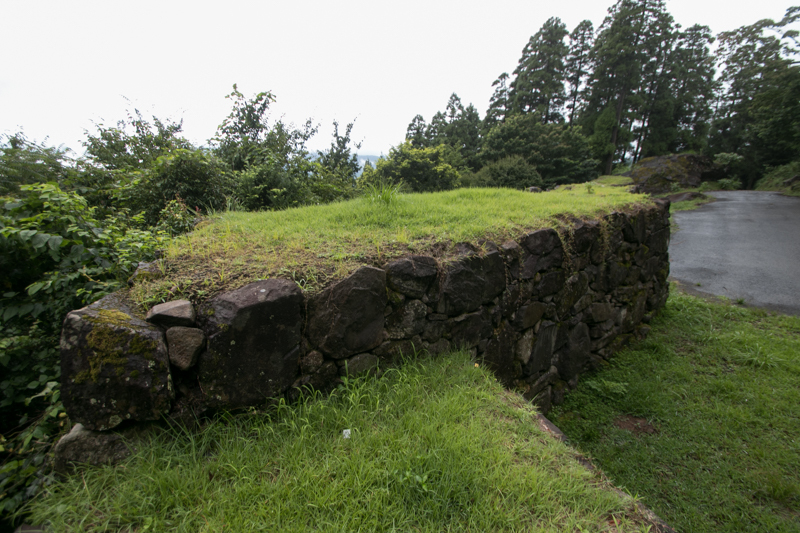 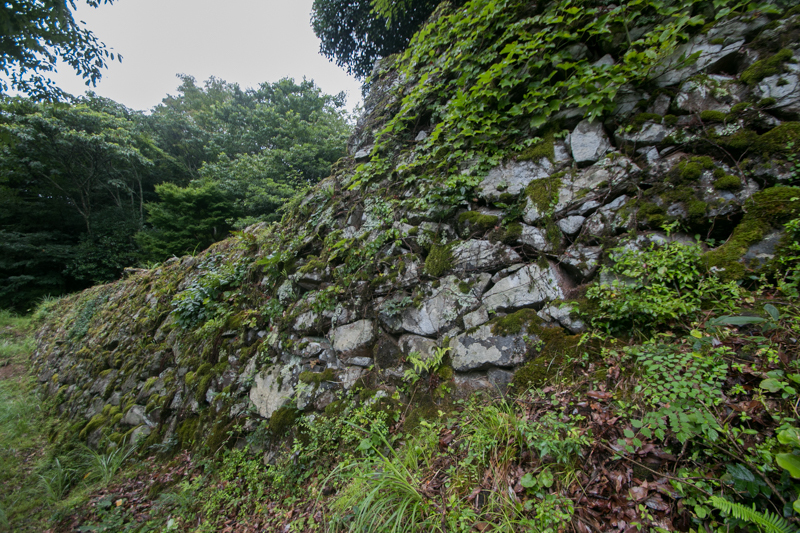 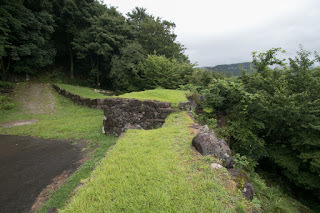 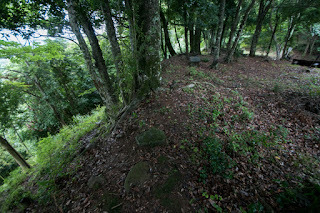 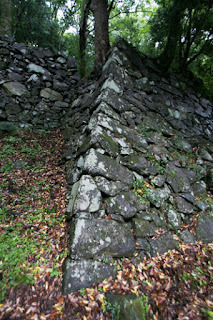 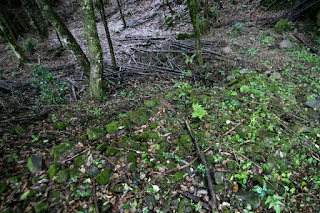 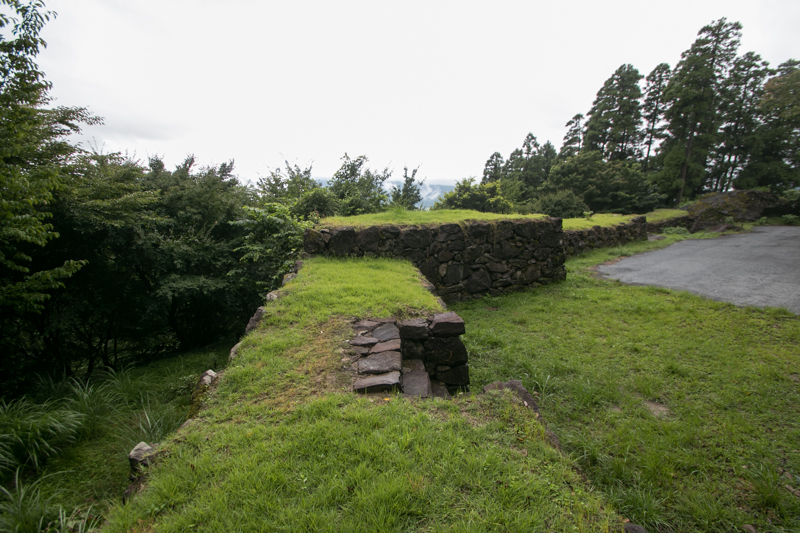 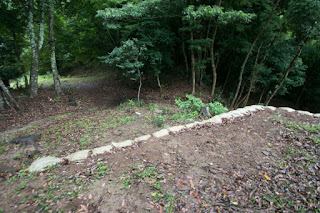 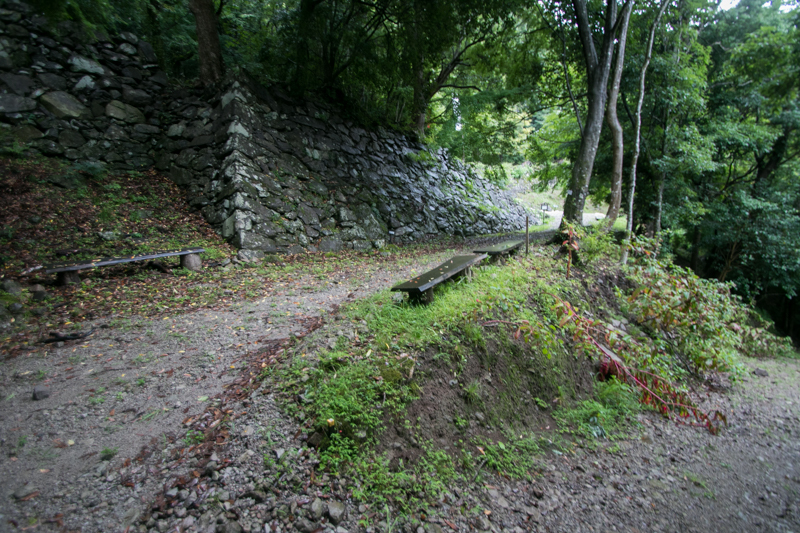 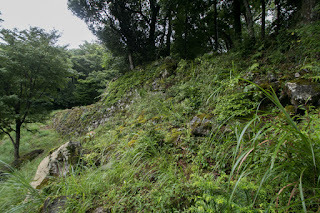 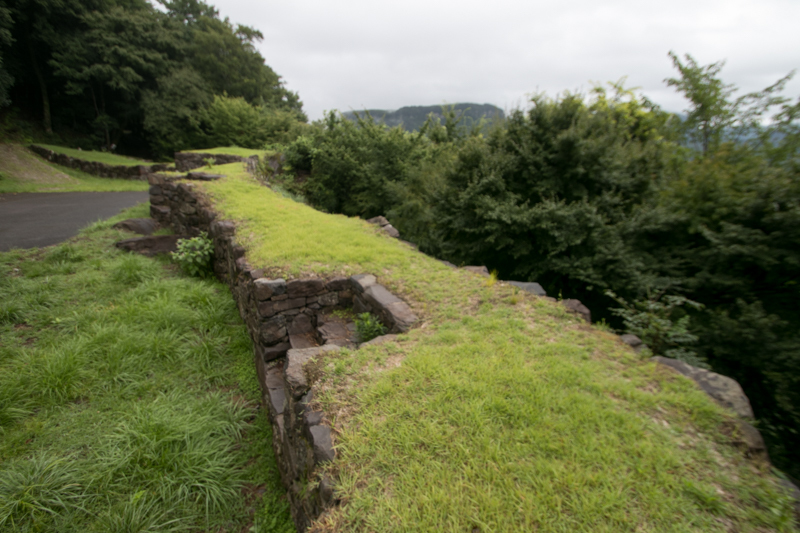 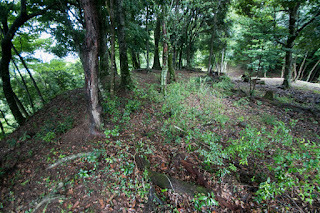 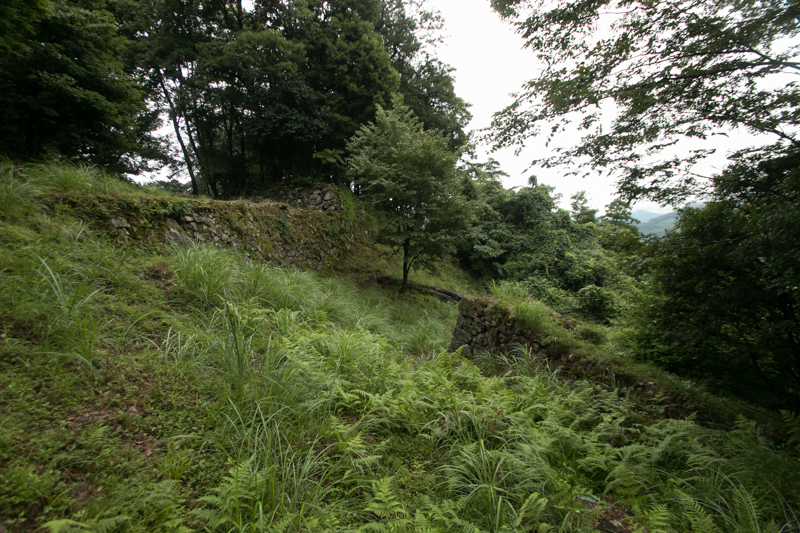 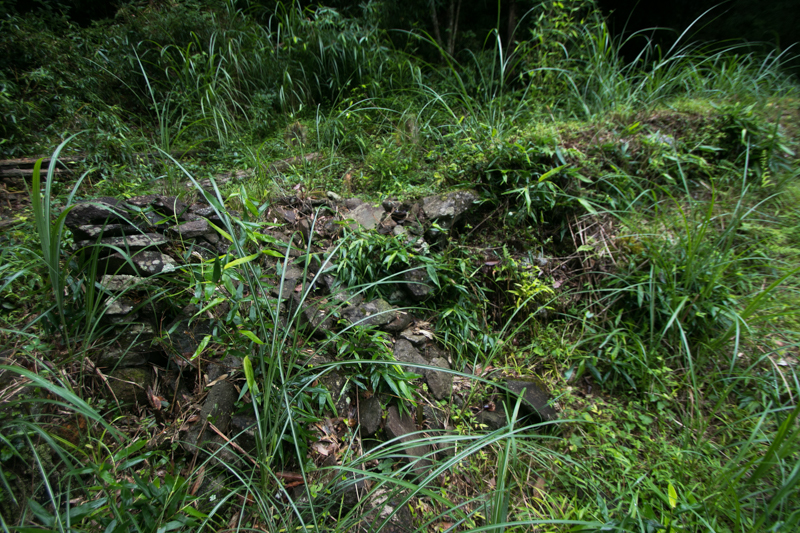 Tsunomure castle roughly consist of four layer of terraces. 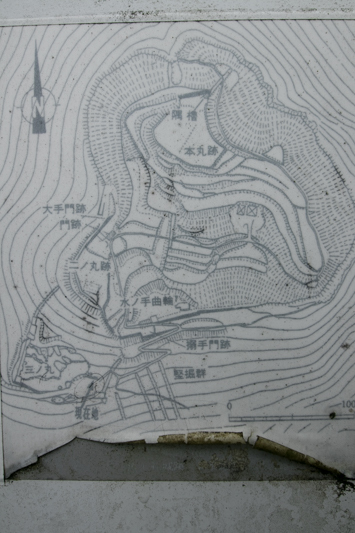 The highest one is the central area and connecting terraces at the peak of mountain. 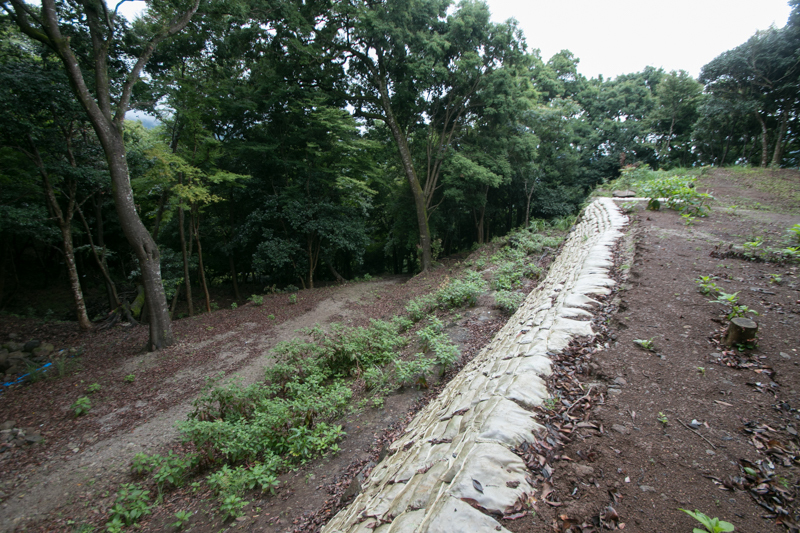 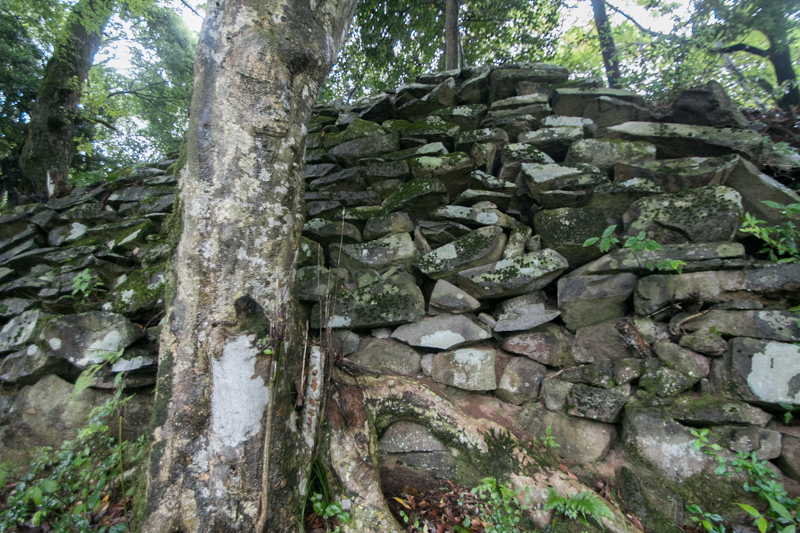 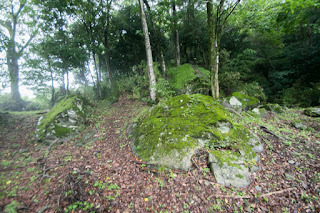 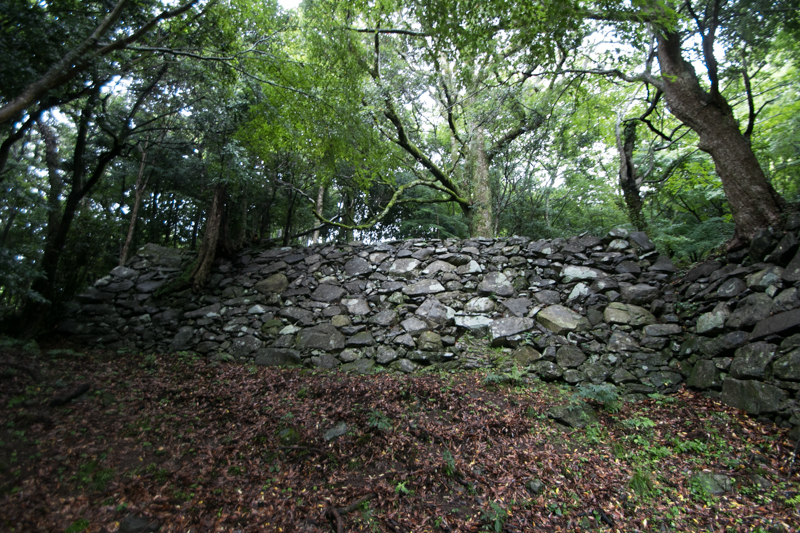 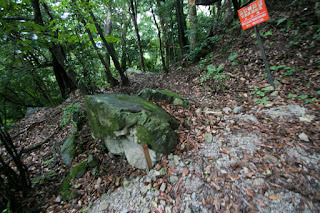 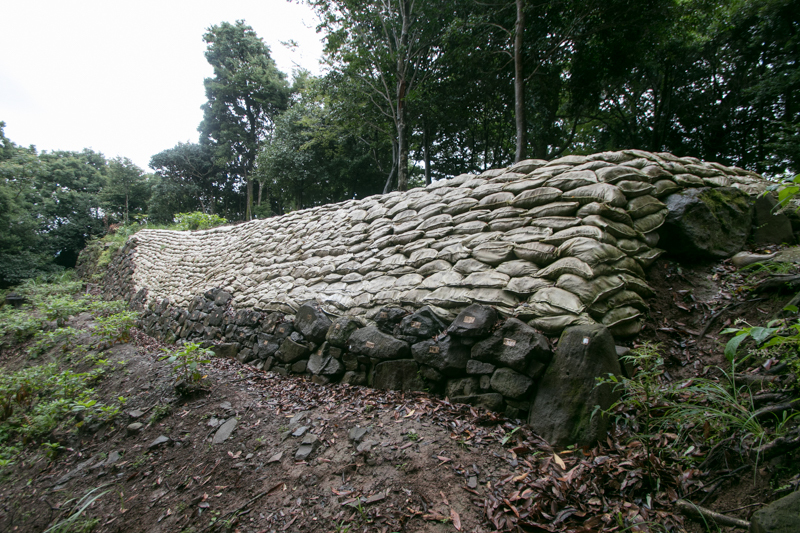 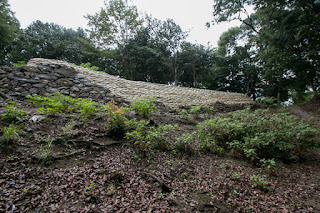 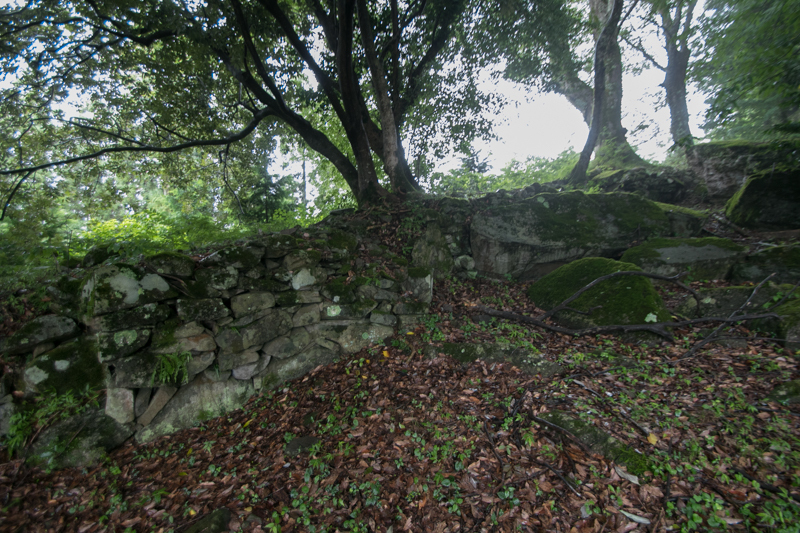 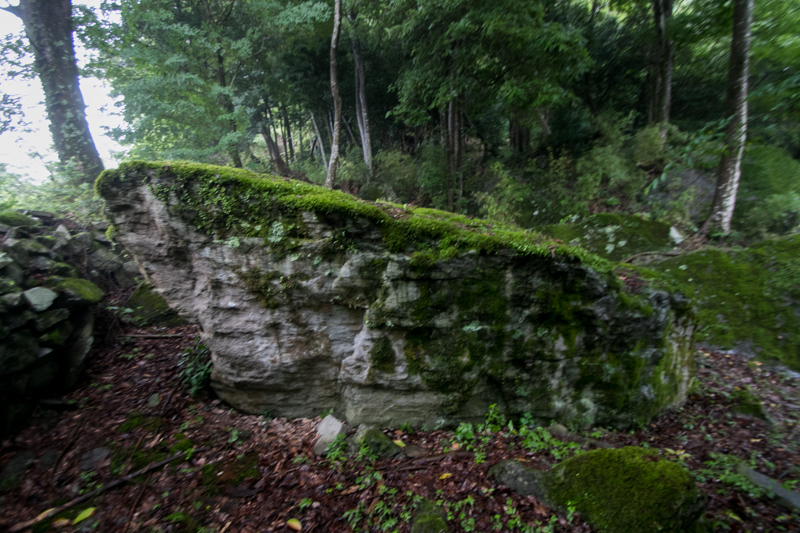 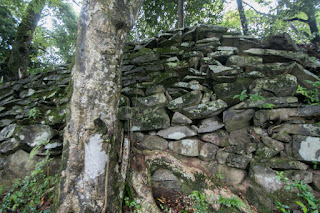 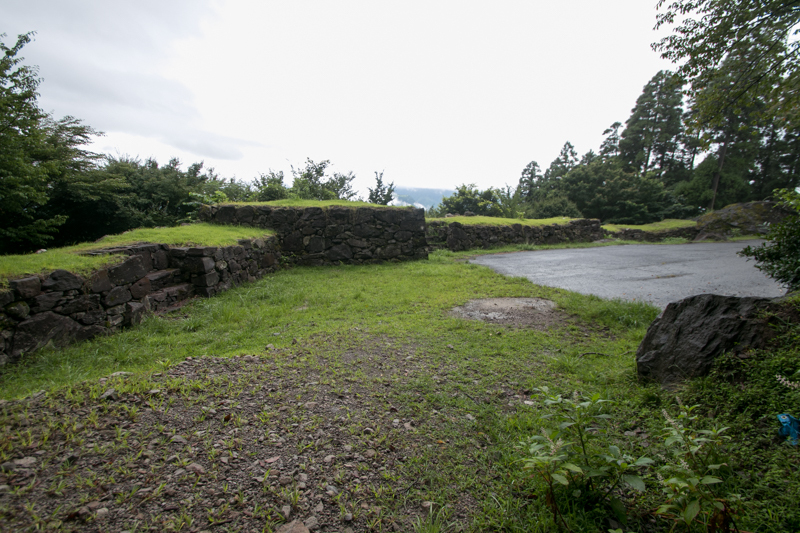 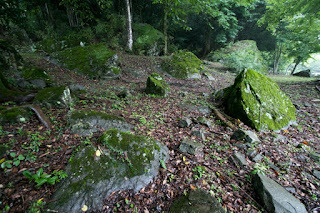 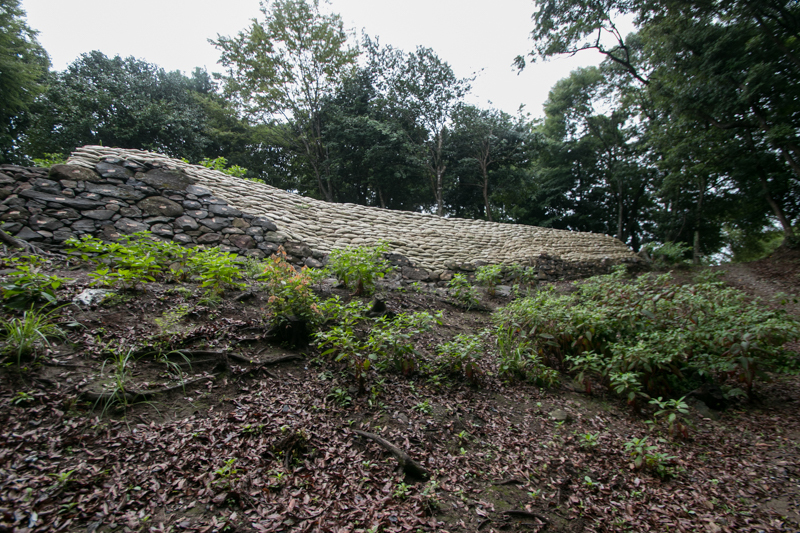 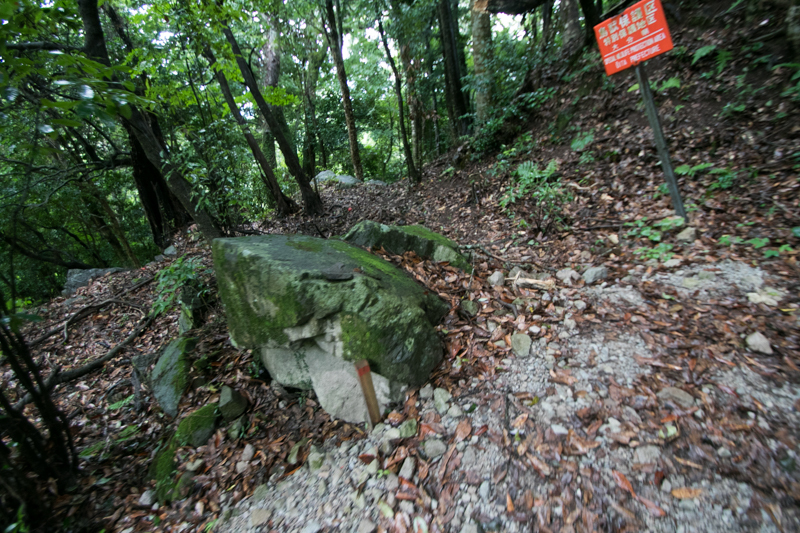 Central area is a irregular polygon shaped area of 50 meter long, and its north slope is protected stone wall. 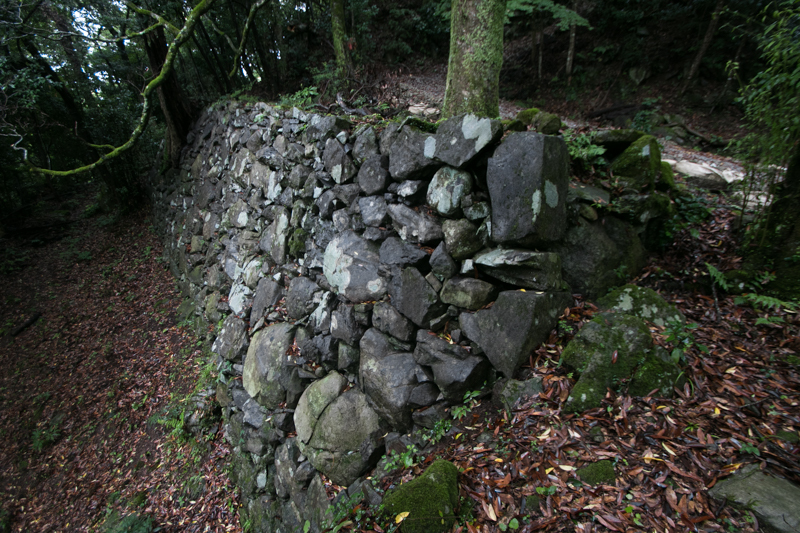 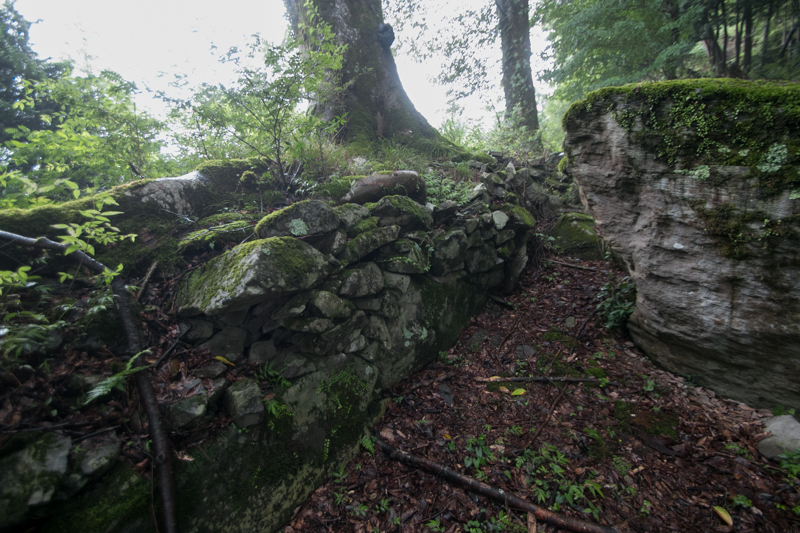 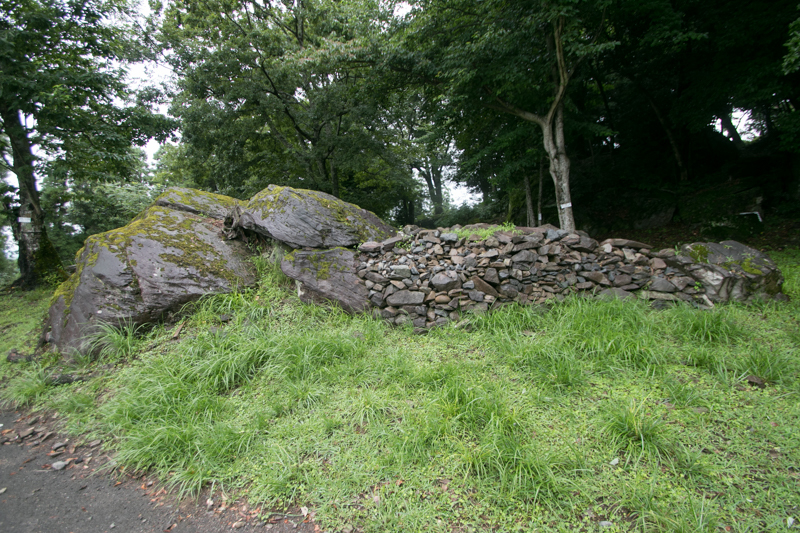 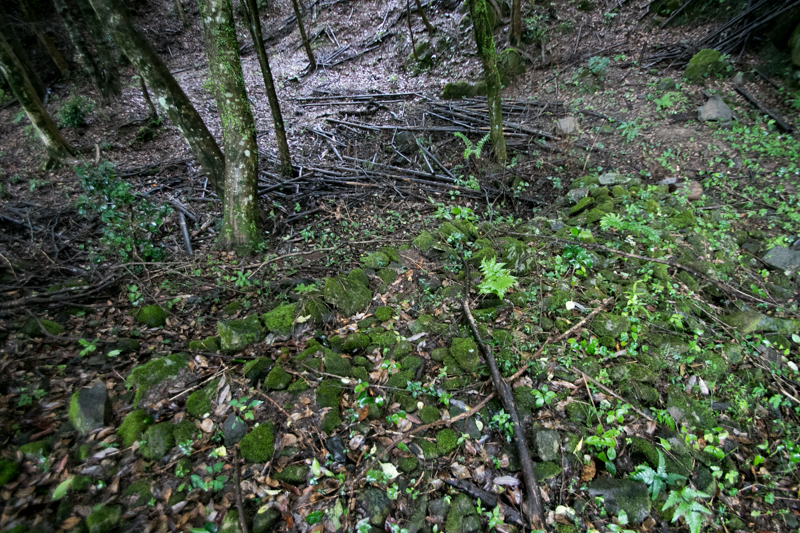 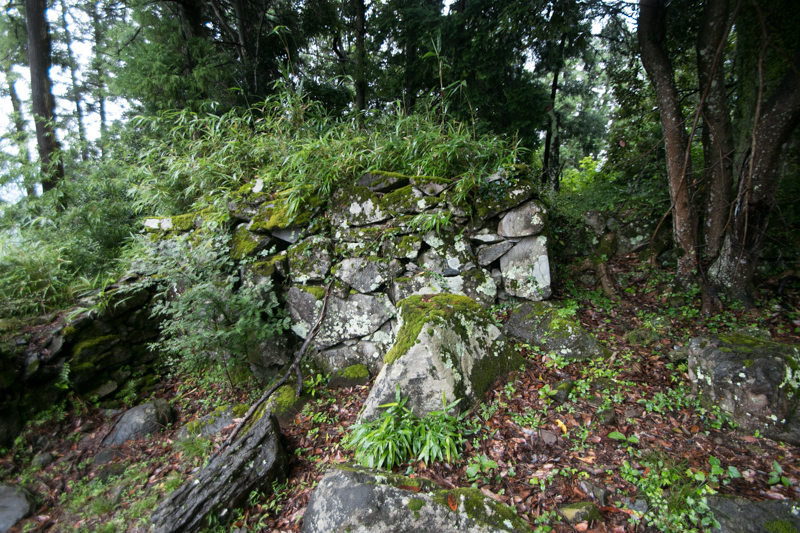 This stone wall is collapsed but originally a large one of 20 meter long and 10 meter tall, and might be used as a basement of main building. 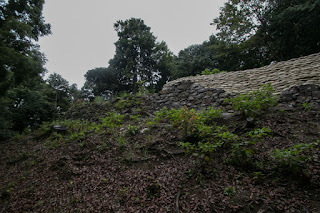 The second layer is a combination of terraces continuing from south to west of central area. 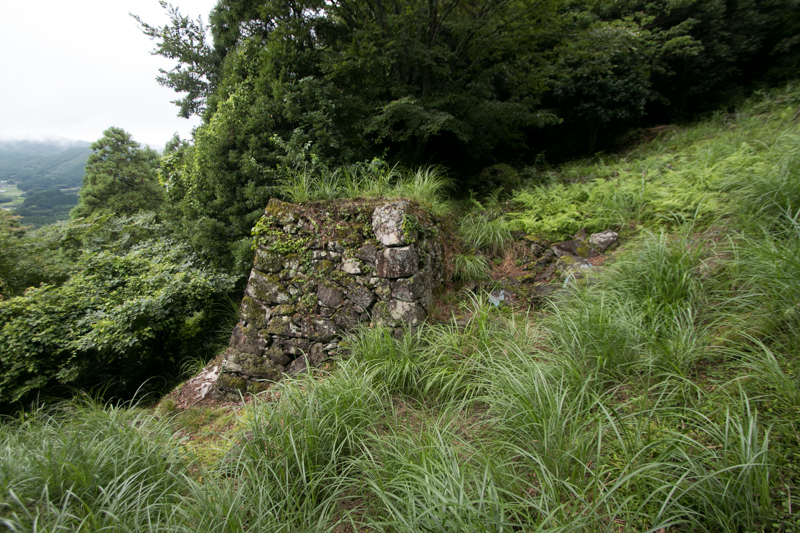 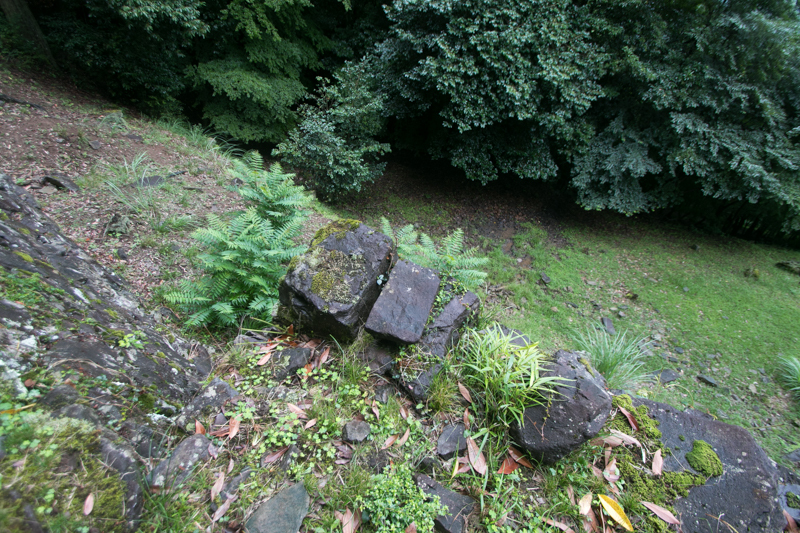 A short ridge continues from the peak toward the southwest is the only one climbing route to the top layer, thus this part is securely guarded by stone walls and turret. 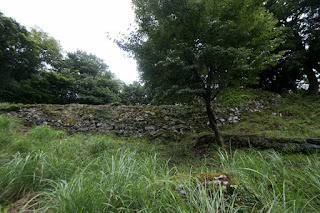 At western slope of this bottleneck place there was a main gate of this castle which is securely guarded by barrack gate, but now no route connects to this gate. Probably this gate was originally the main gate of castle but along with the expansion of lower area it could turn to the backside. 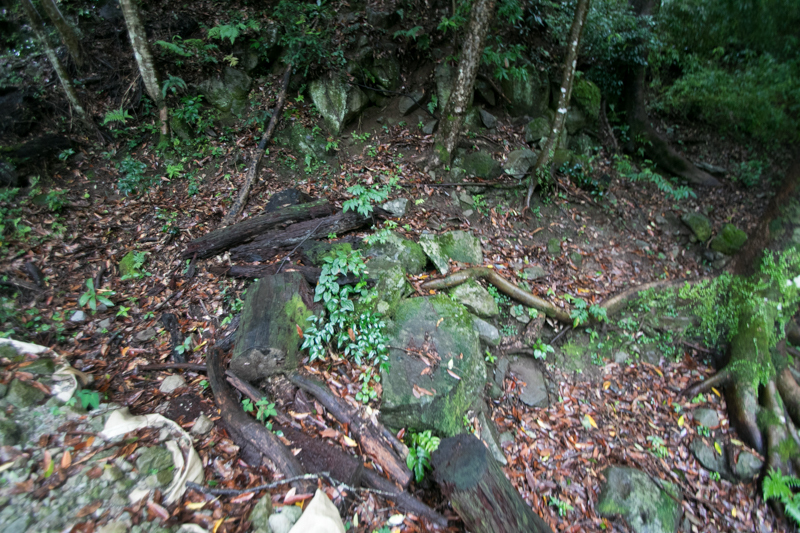 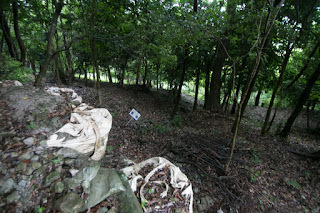 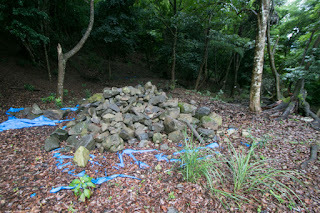 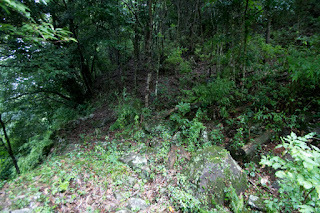 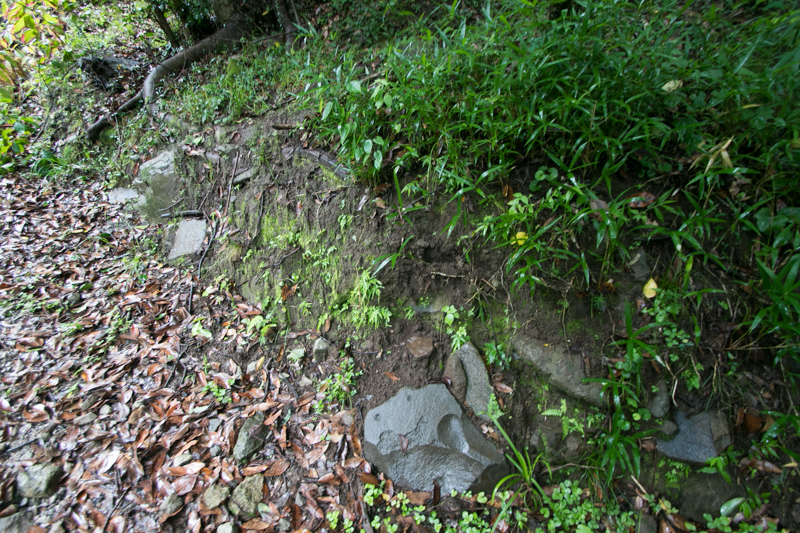 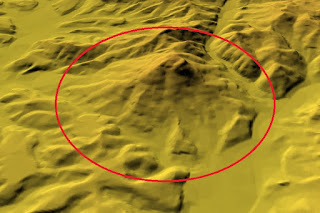 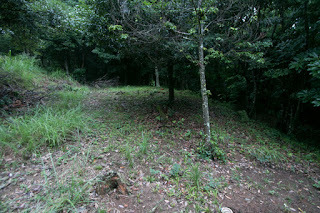 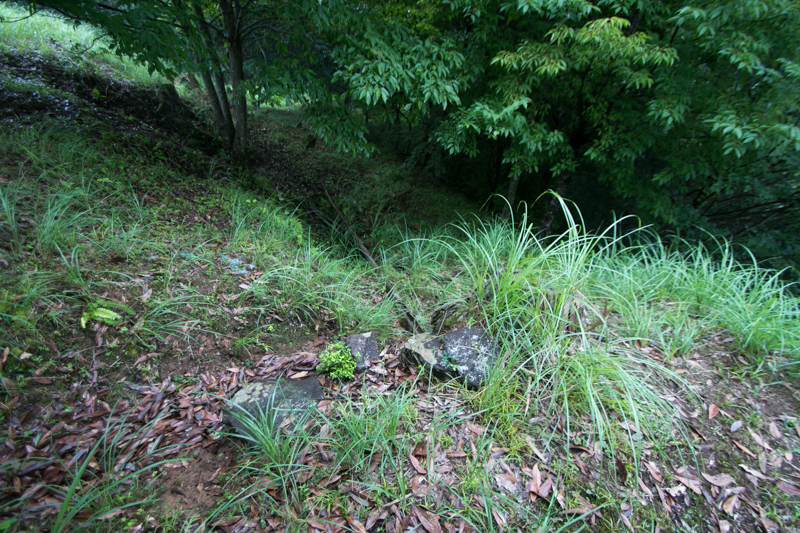 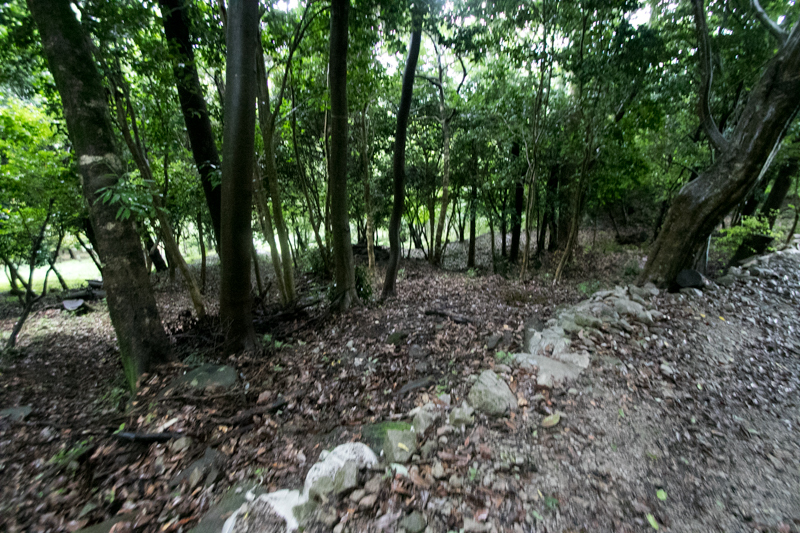 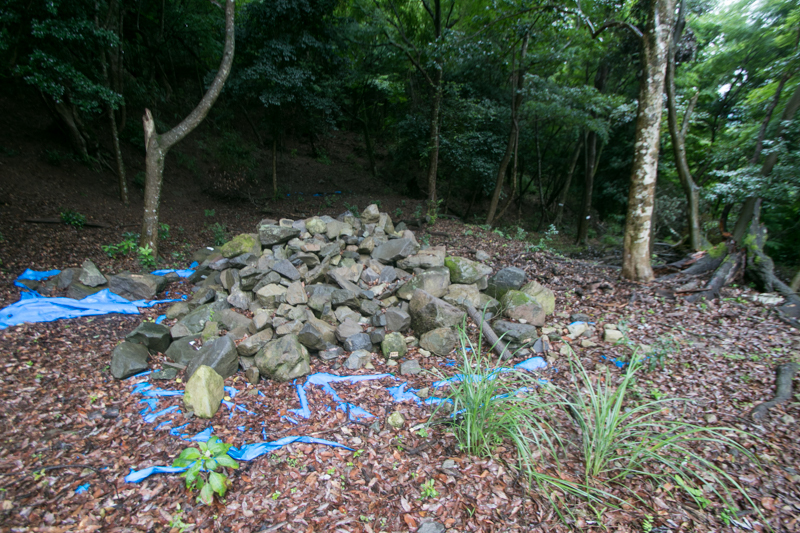 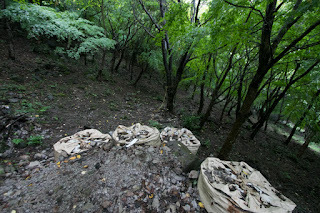 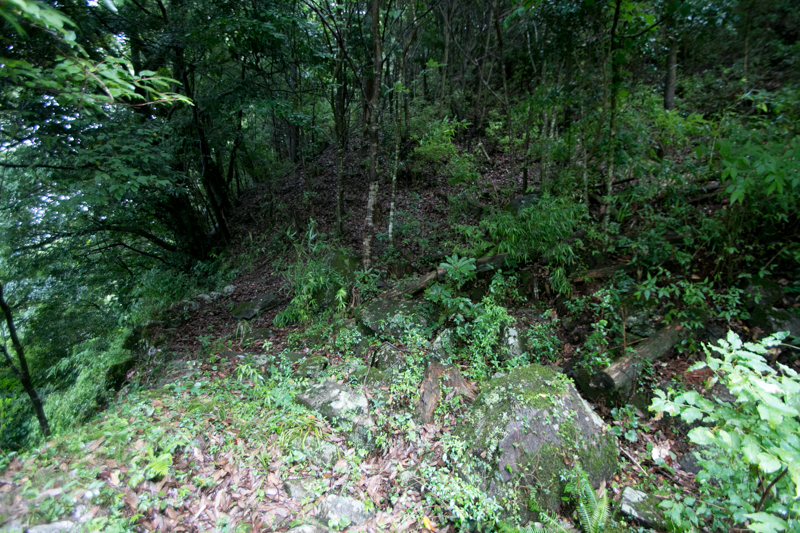 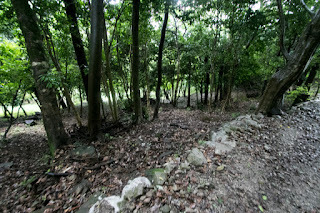 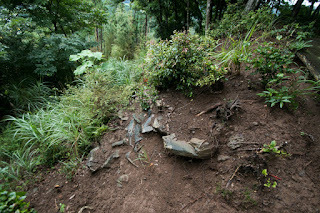 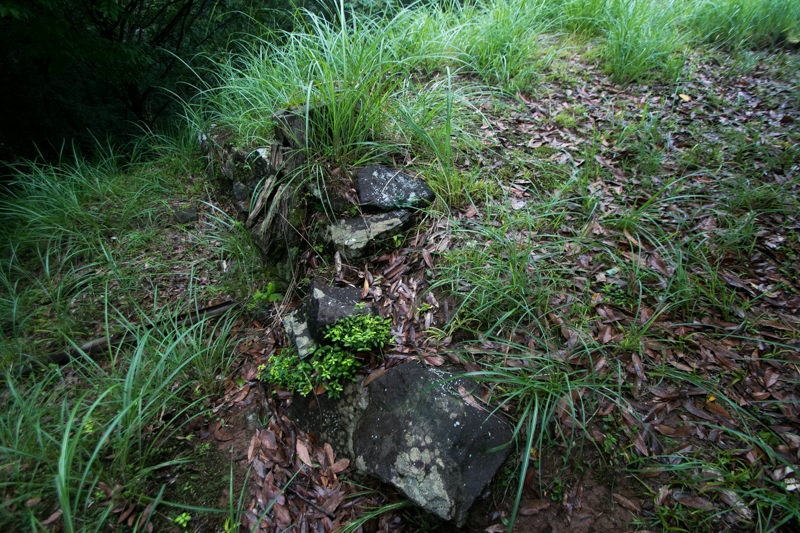 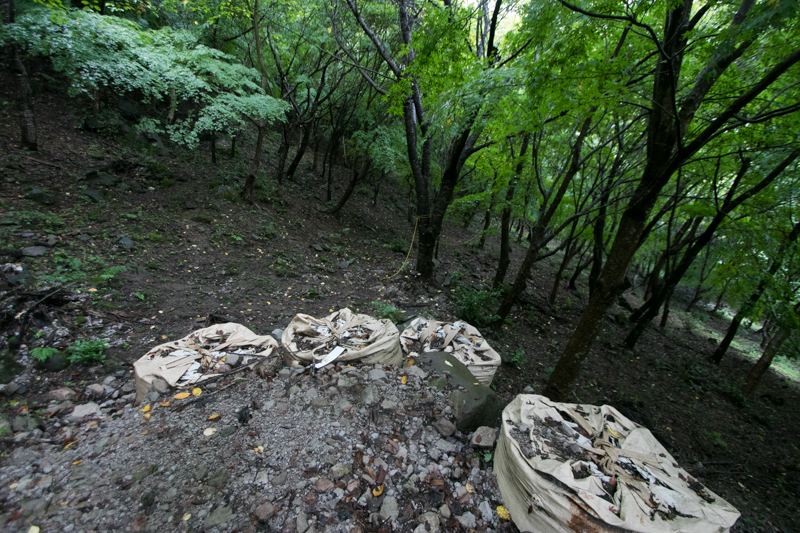 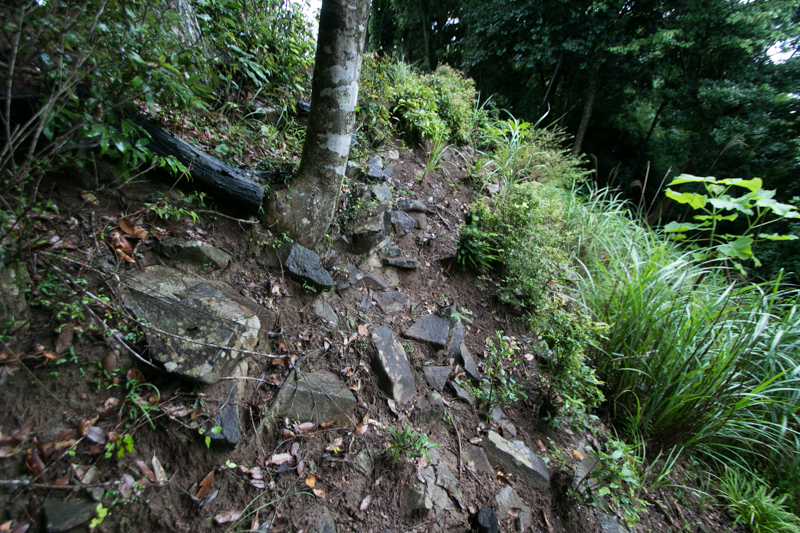 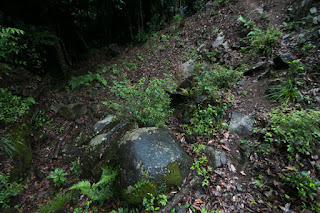 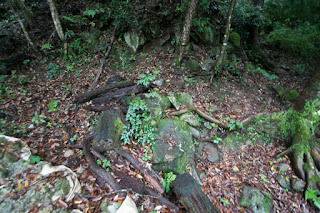 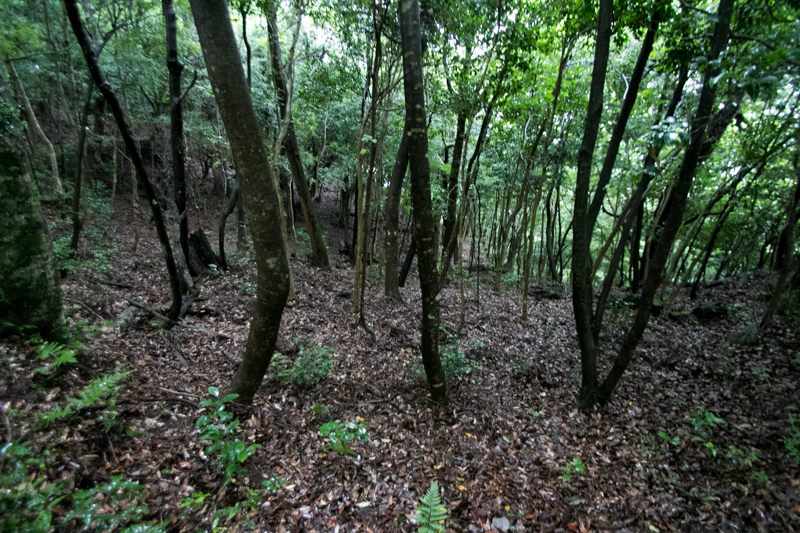 The third layer is at the below of secondary area at the south slope of the mountain. 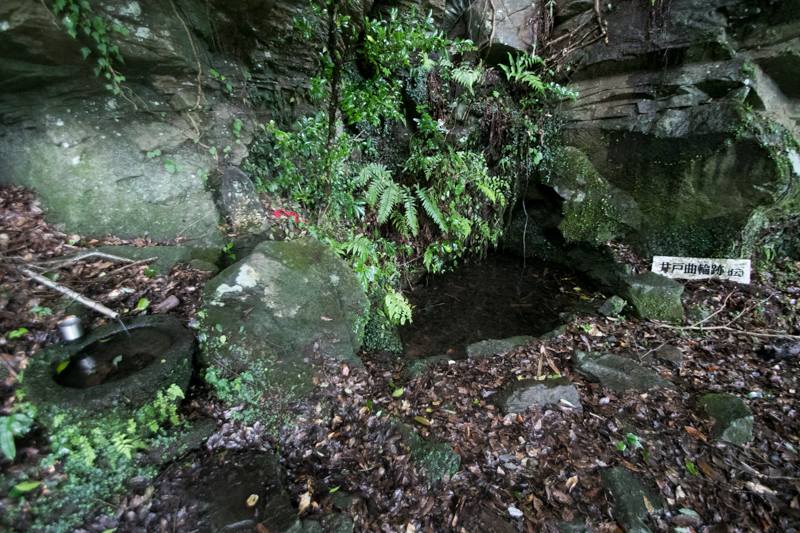 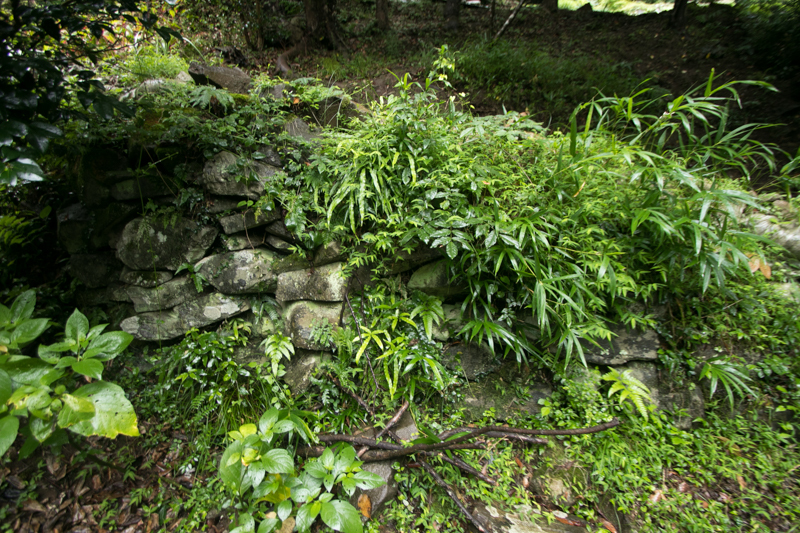 This part consist of upper layer and lower layer, and upper layer has a well and was used as a water source. 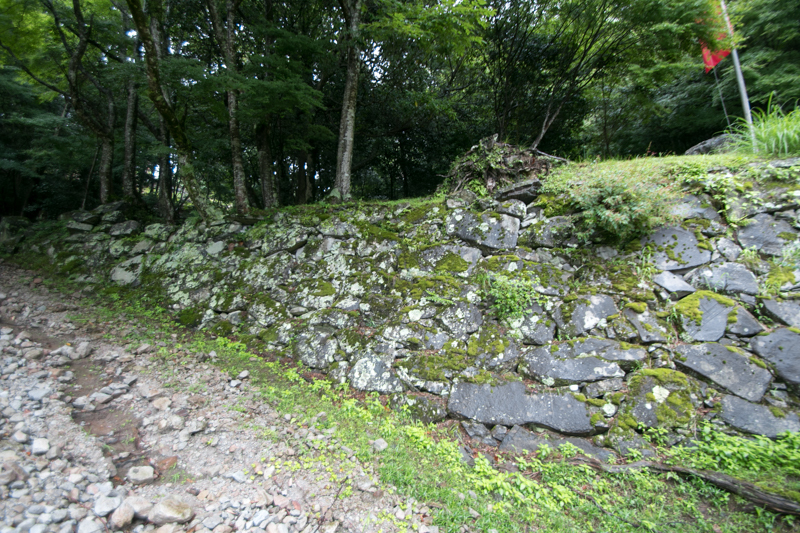 Upper layer is wholly secured by stone wall, and there is a broad slope from lower area to upper area broadened by stone wall. 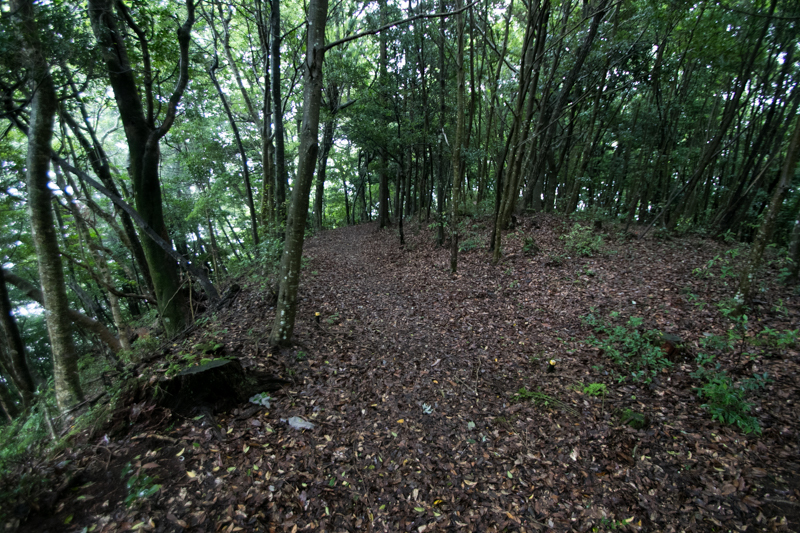 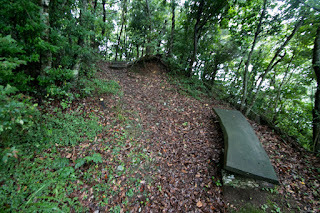 This slope is a backside but substantially main gate, and there was another barrack gate. 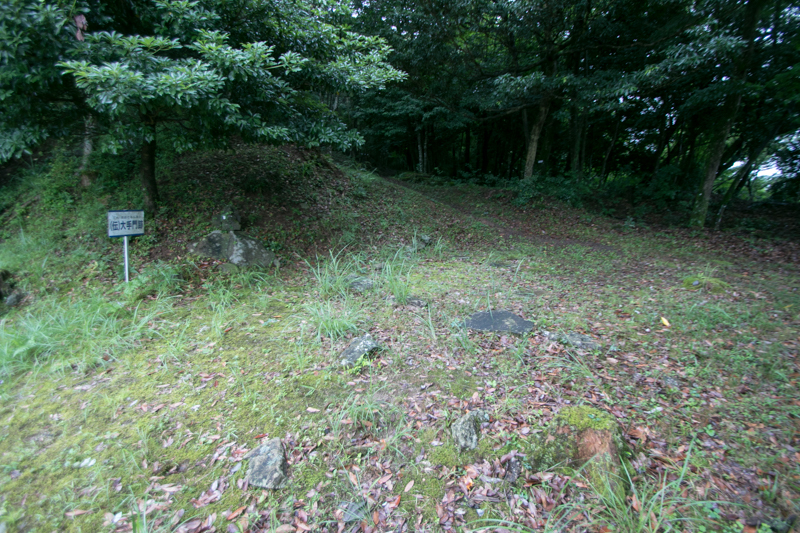 The fourth layer was third area built by digging the gentle slope at the southwest side slope. 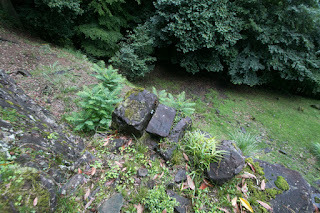 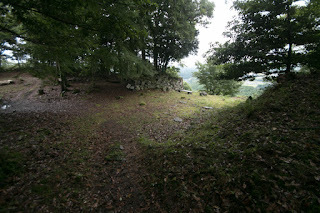 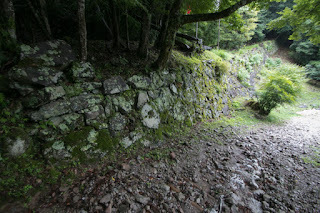 This area is clearly added in later period, and guarded by linear line of stone wall with small basement of watchtower. 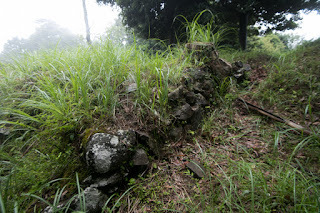 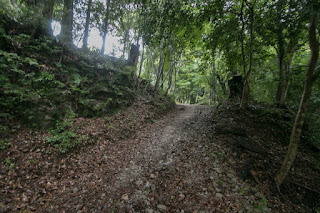 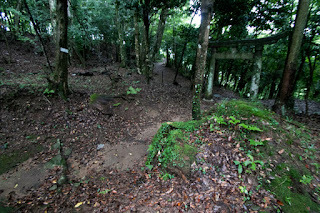 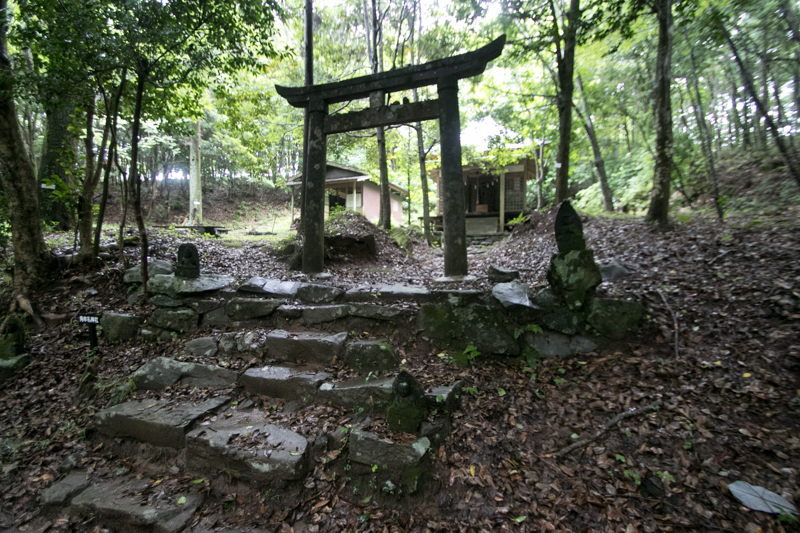 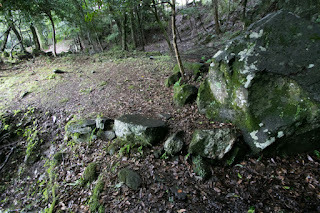 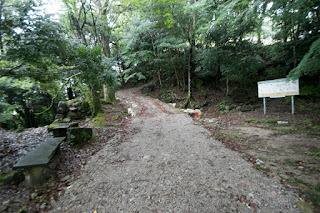 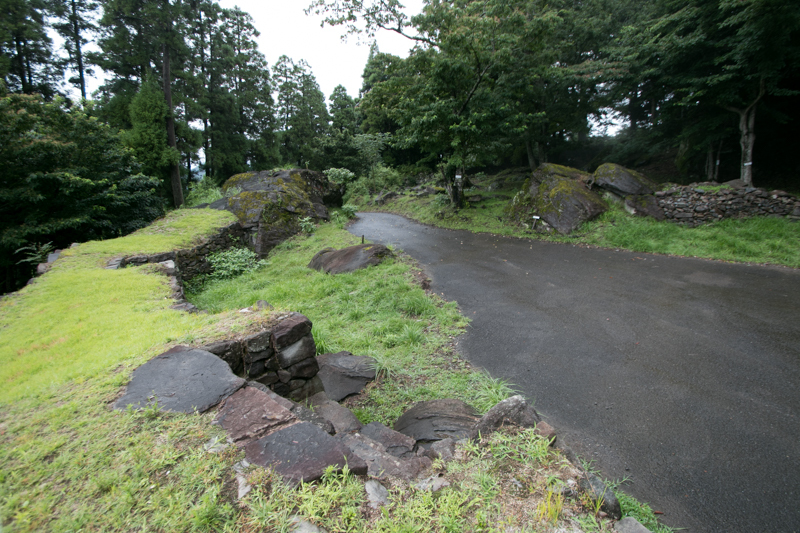 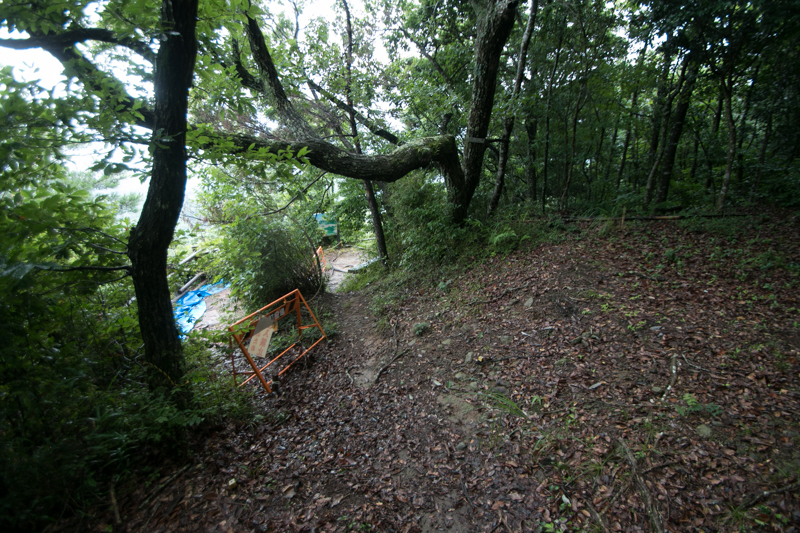 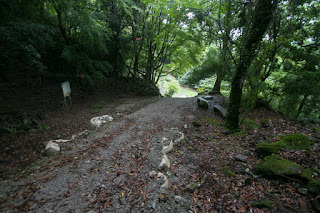 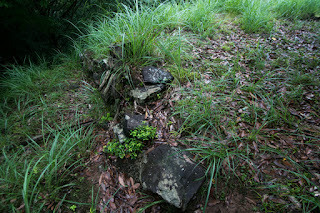 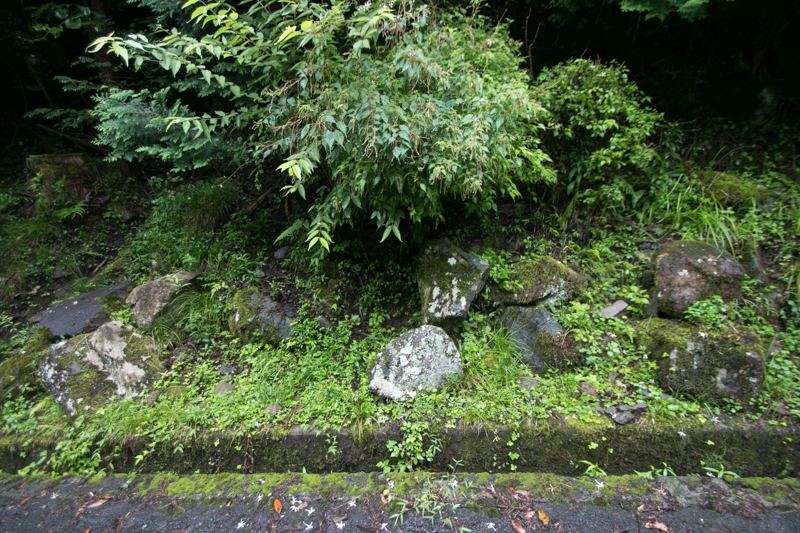 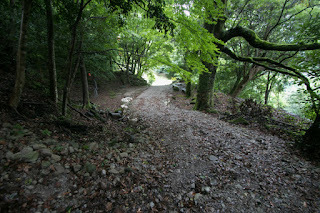 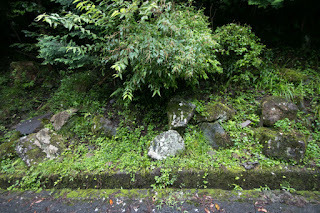 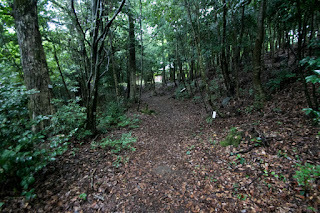 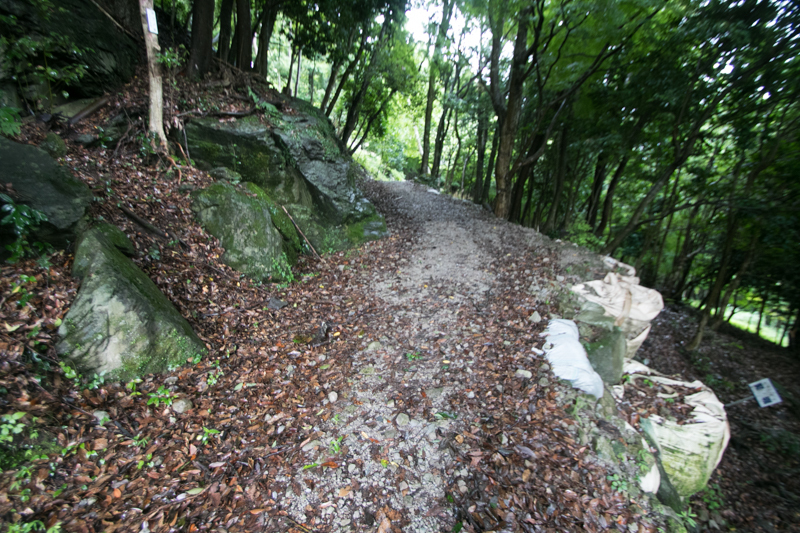 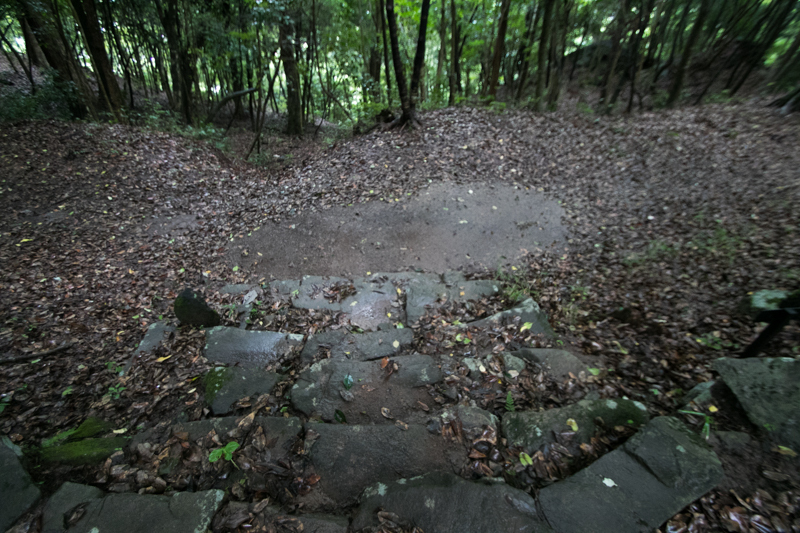 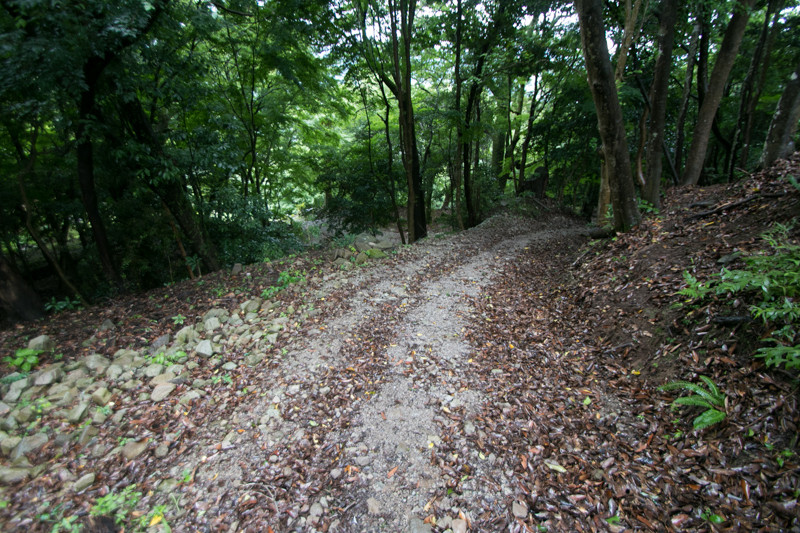 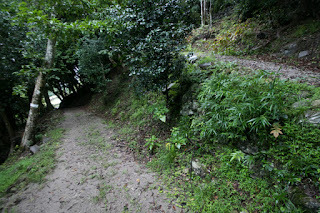 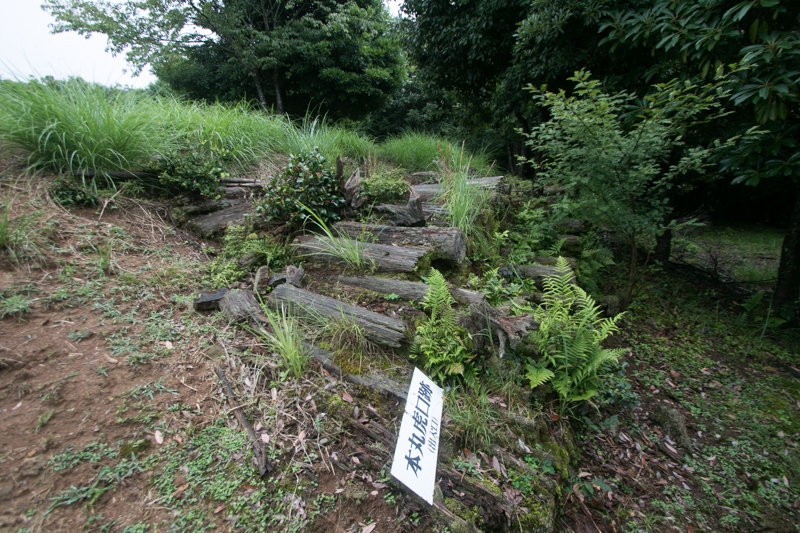 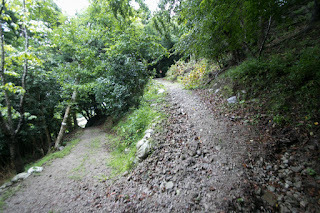 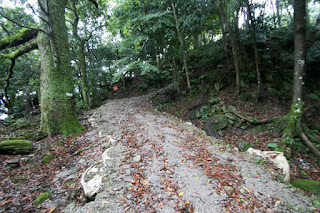 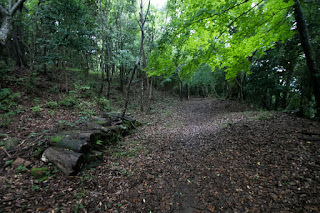 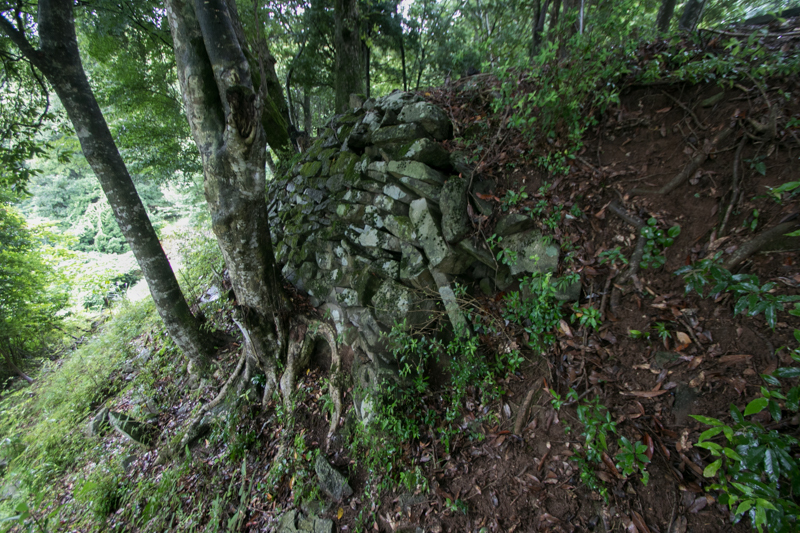 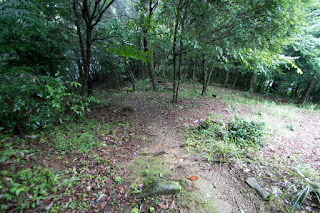 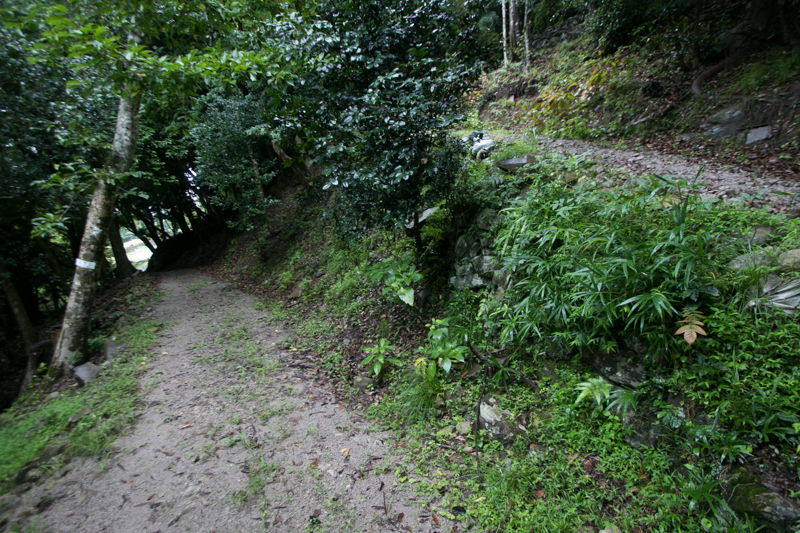 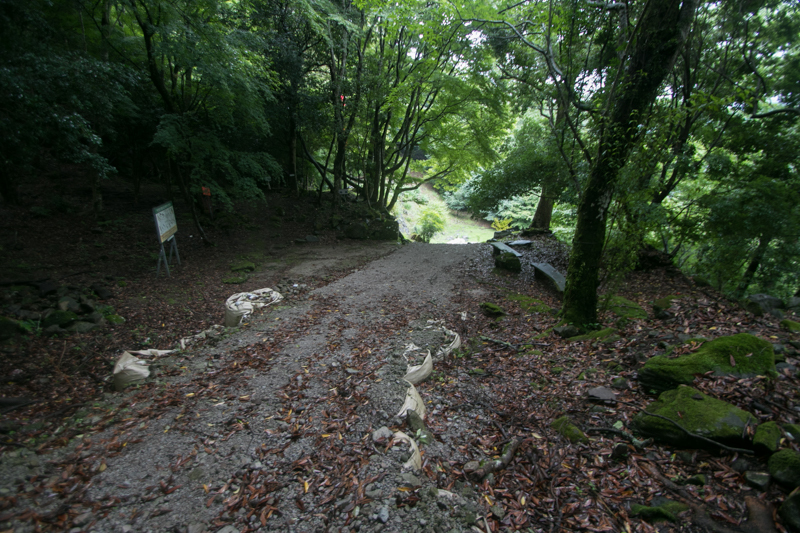 Although it was a bit broken by road, but there might be a masugata style outer gate with folded path. Total size of the castle is about 200 meter long and 100 meter wide, and a standard size one as a branch castle. 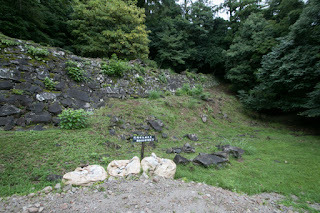 After the death of Hideyoshi, at the battle of Sekigahara between Ieyasu Tokugawa (1543-1616) and Mitsunari Ishida (1560-1600) in 1600, Takamasa at first supported Mitsunari but turned to the winner Ieyasu in the middle. After the battle Takamasa was forgiven but lost Kusu area and Hita area, then Kurushima clan which was originally a naval clan of Setonaikai sea and the lord of Kurushima castle (Ehime prefecture) was appointed as a lord of Kusu area. 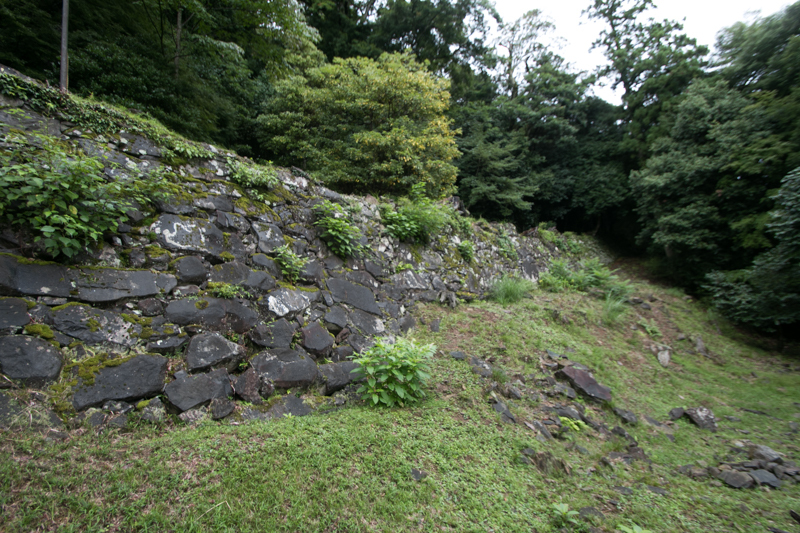 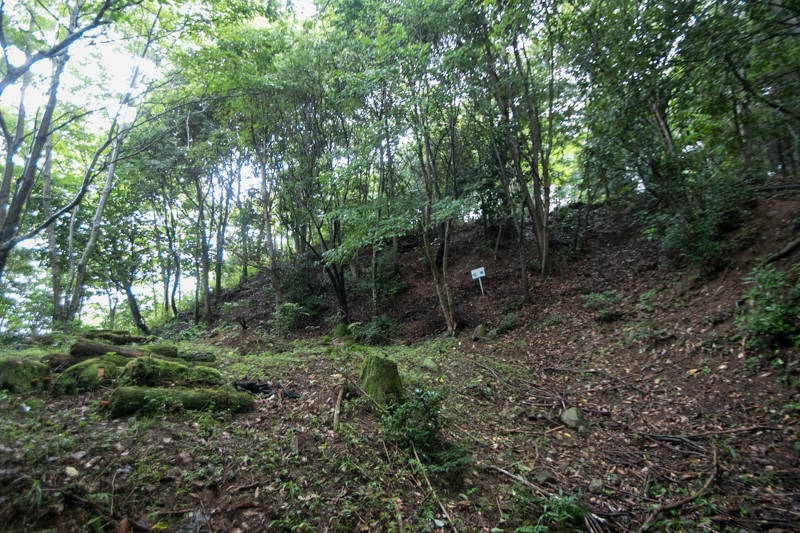 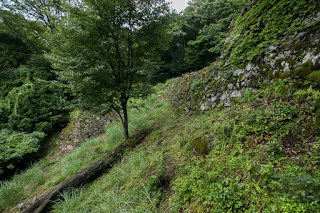 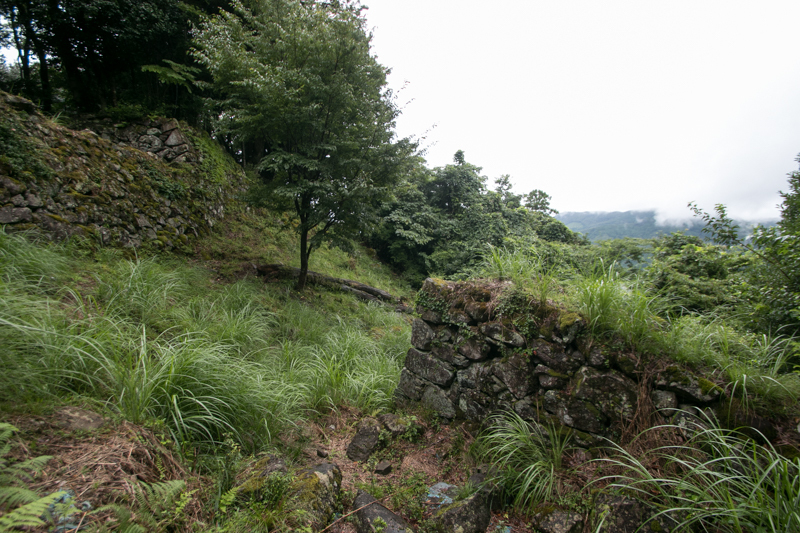 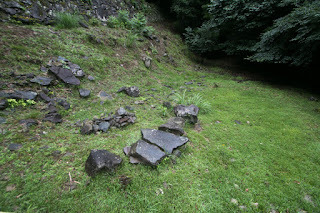 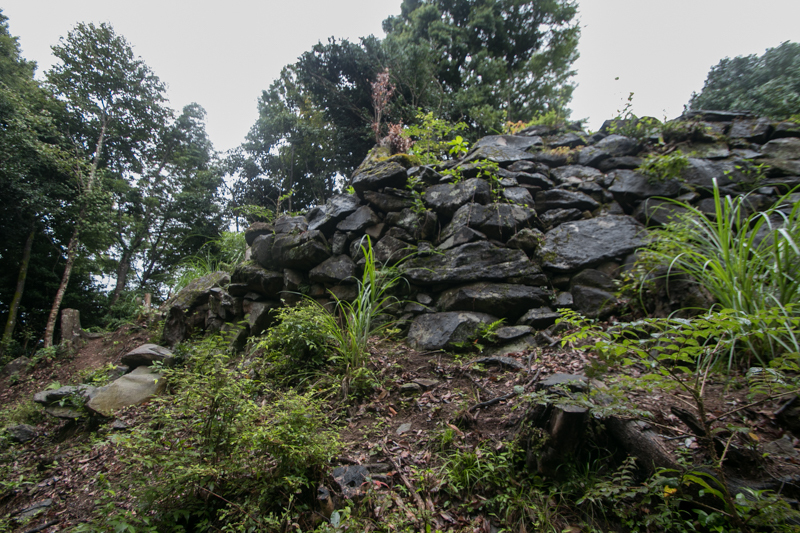 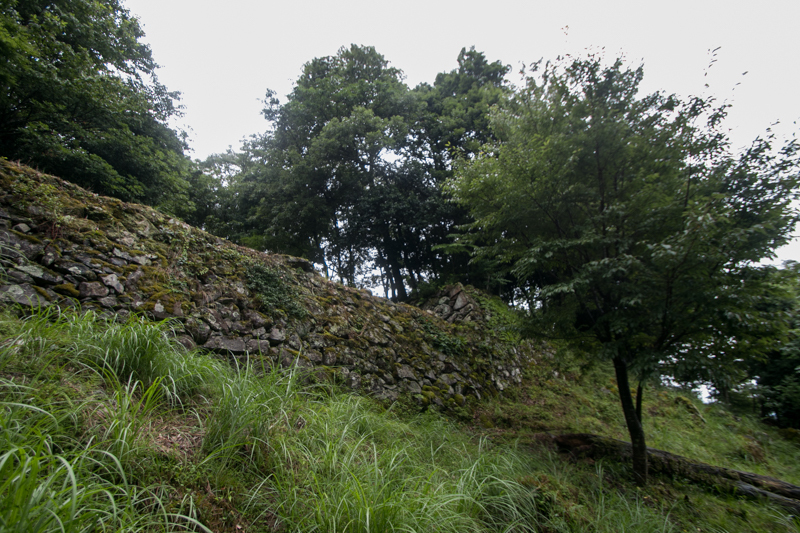 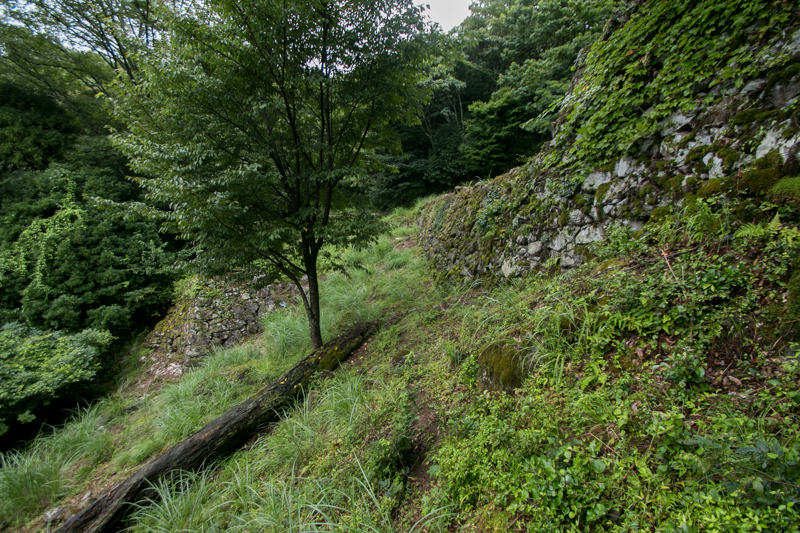 But because of its small territory Kurushima clan could not have the castle, then abolished Tsunomure castle and resided at the side of the mountain. 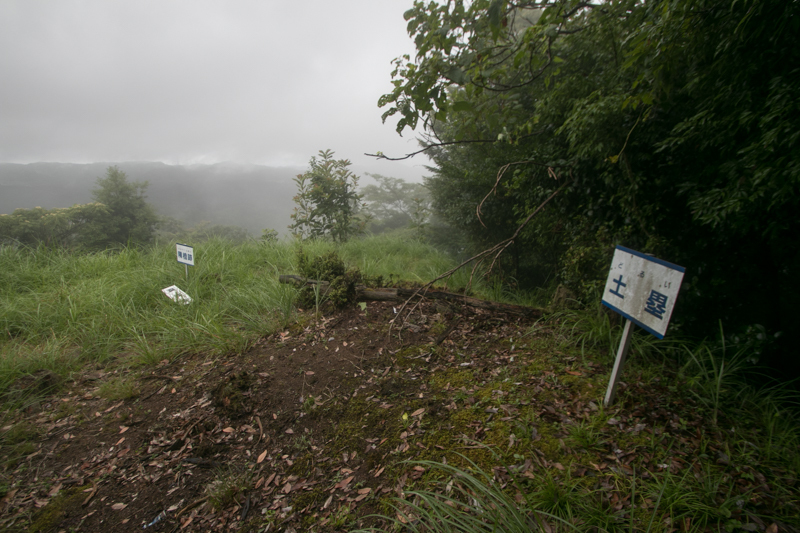 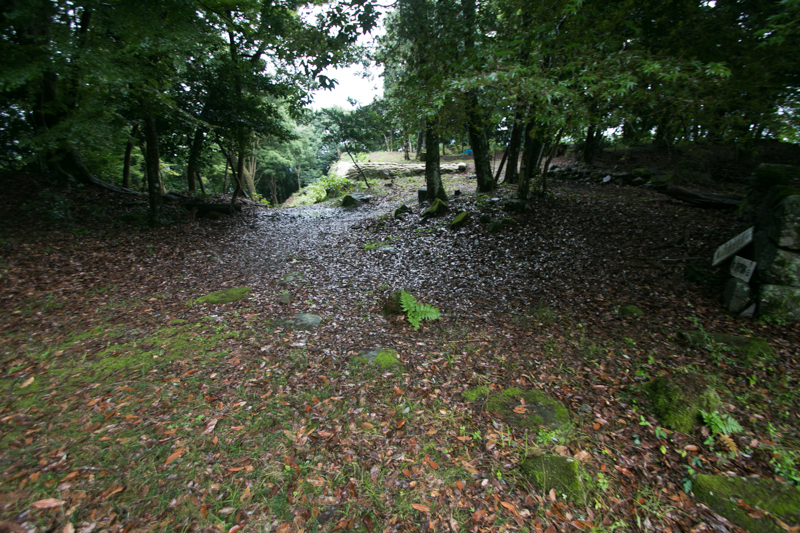 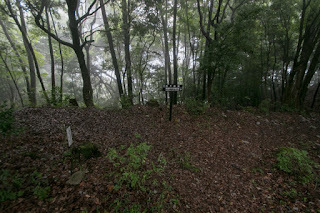 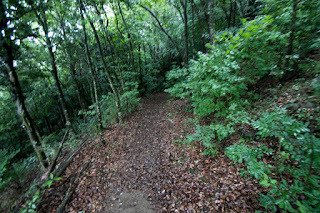 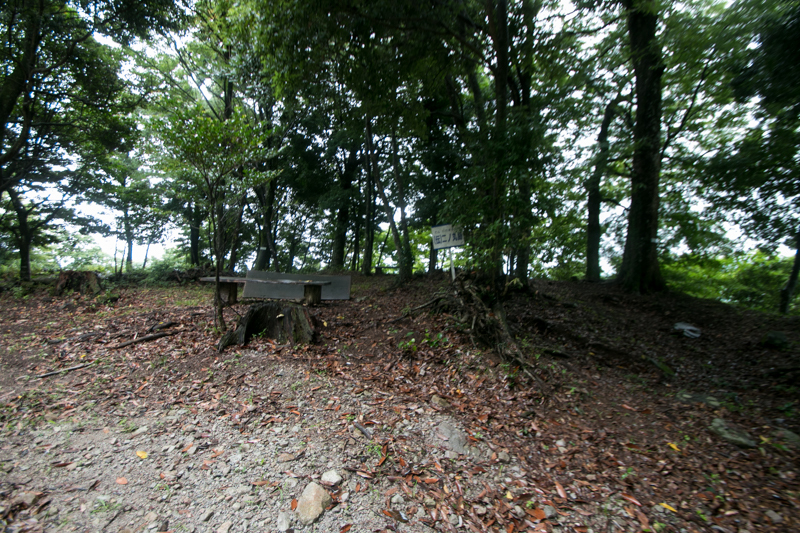 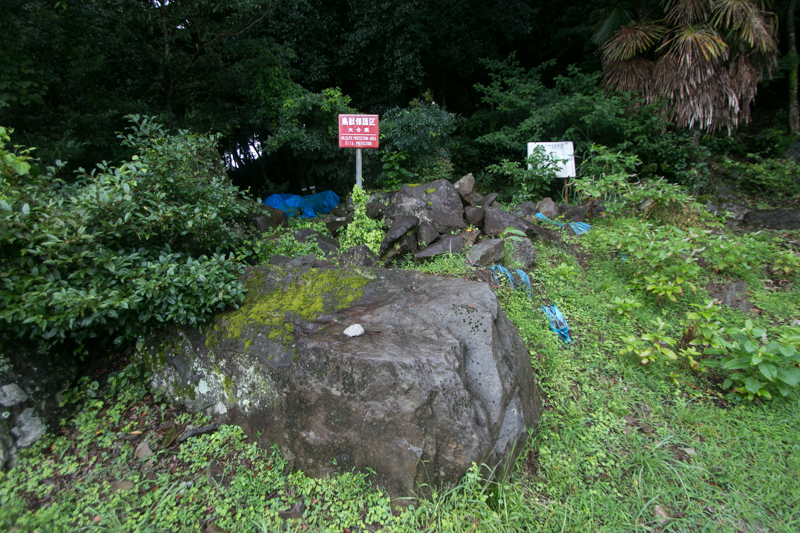 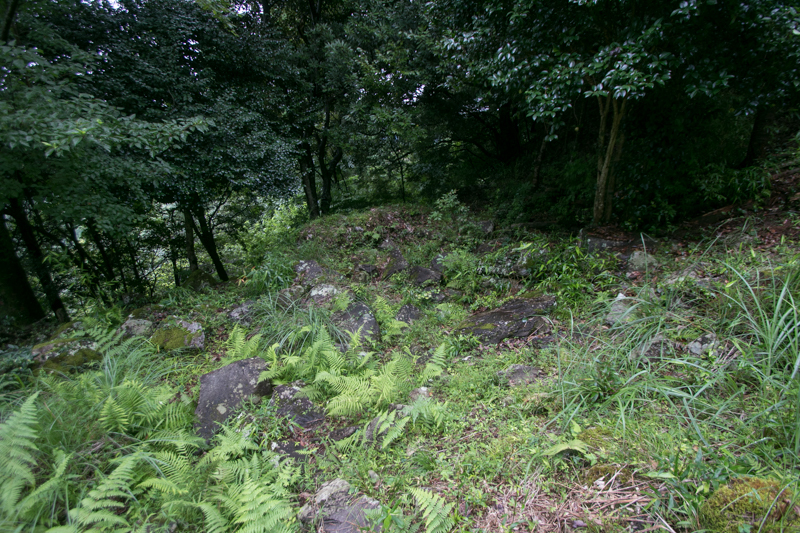 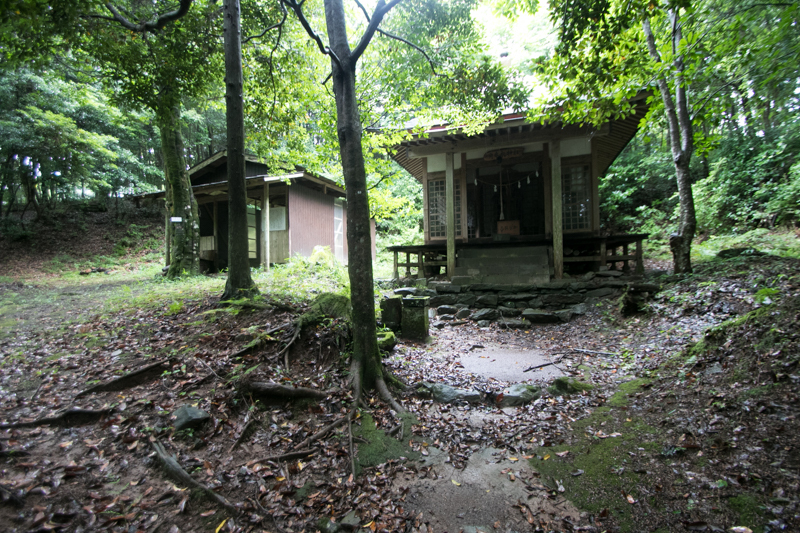 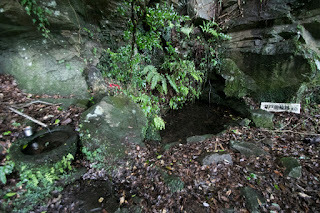 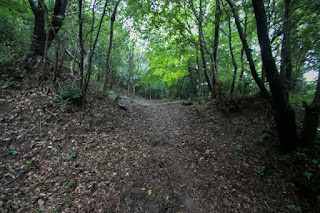 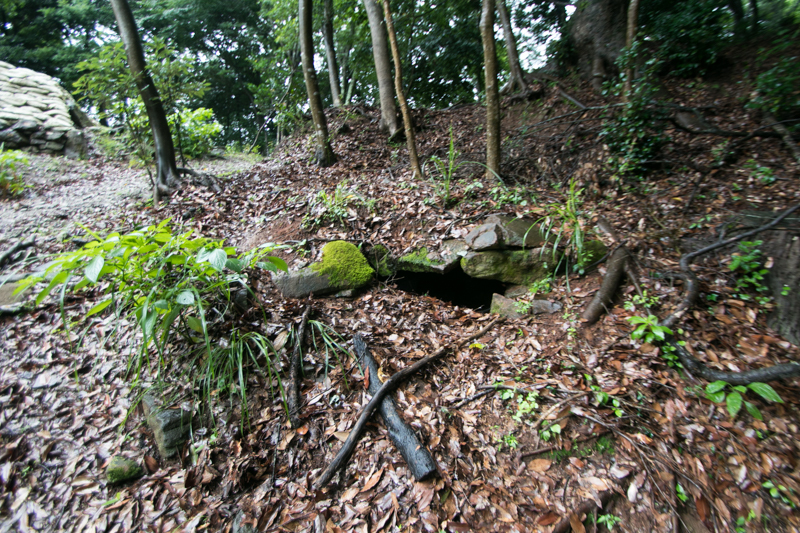 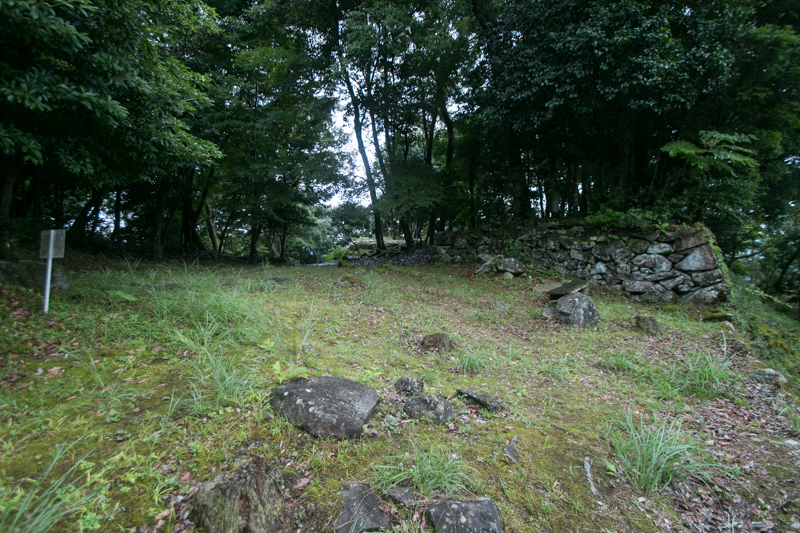 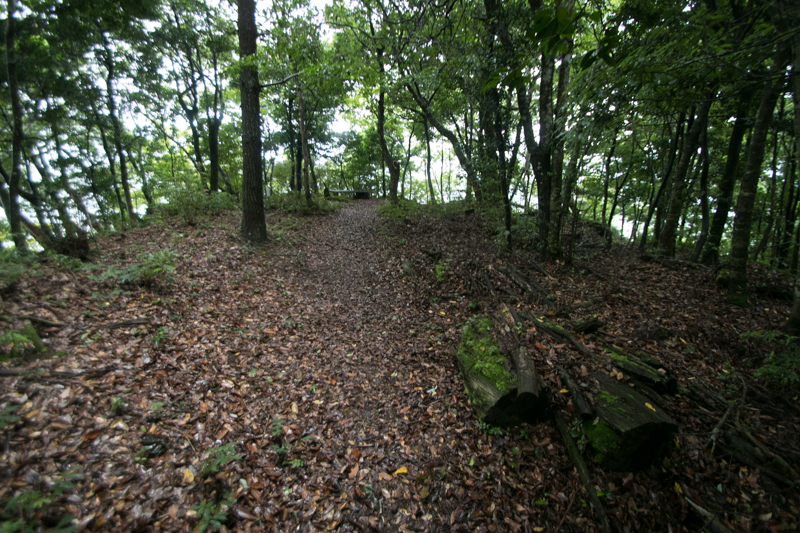 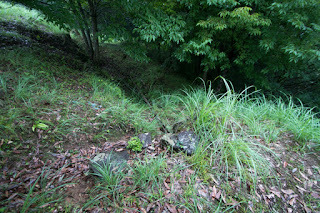 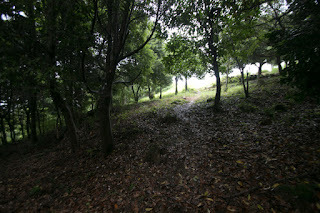 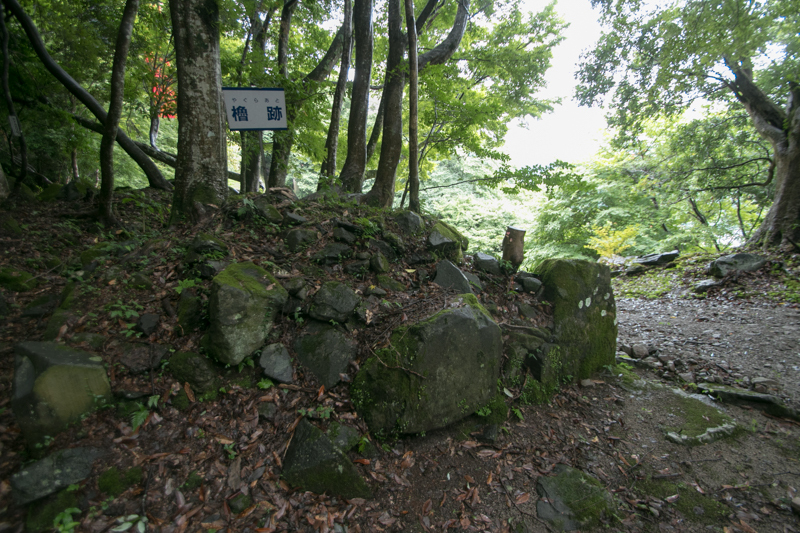 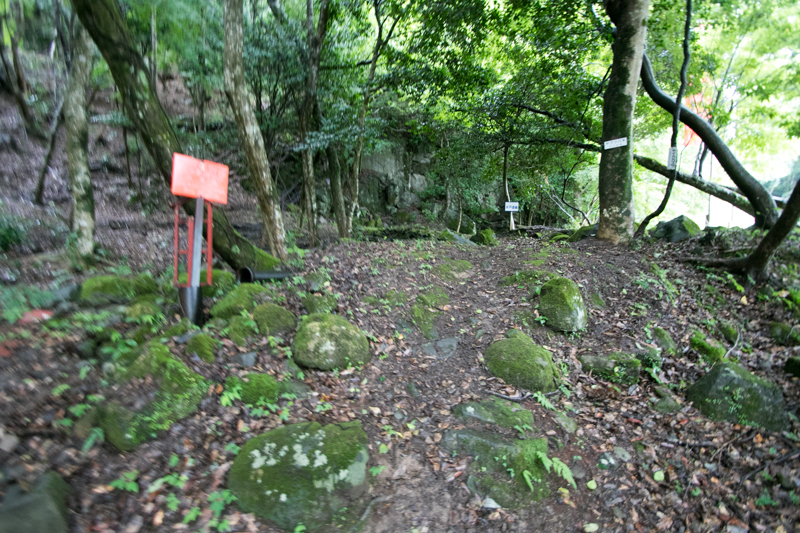 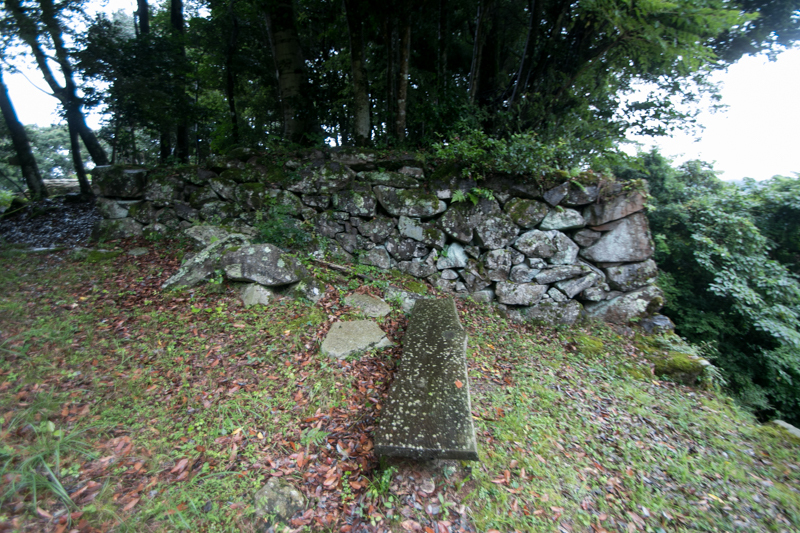 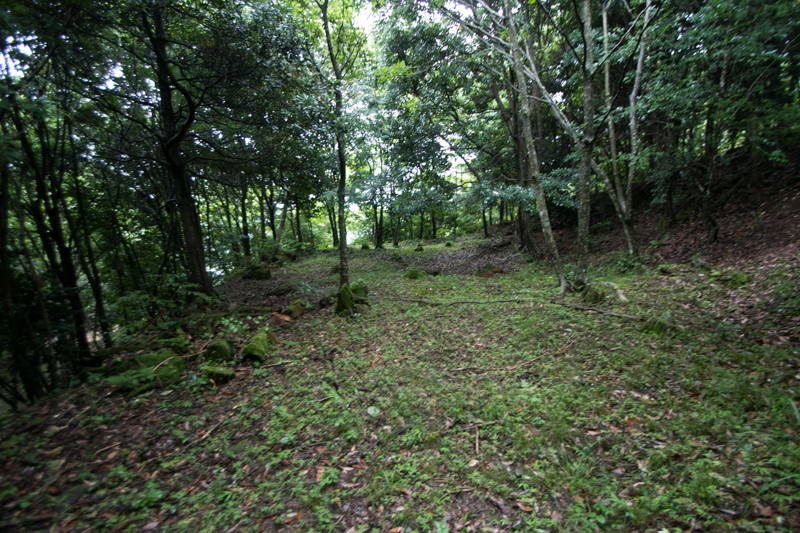 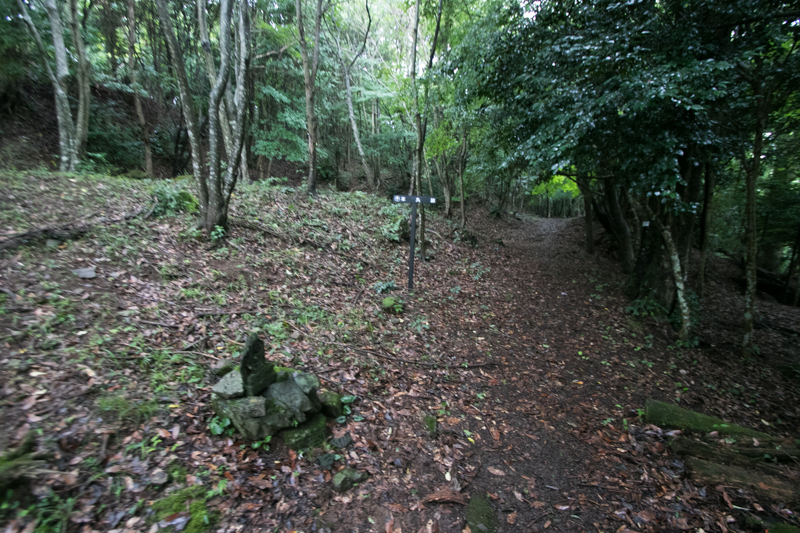 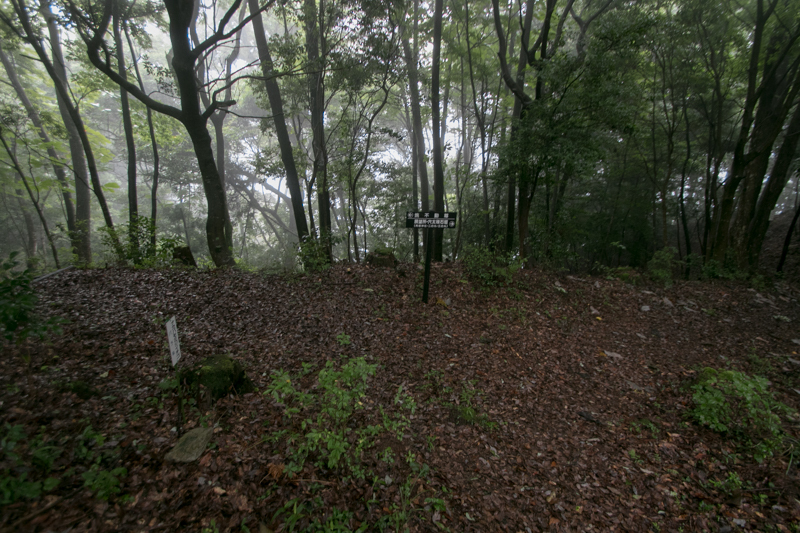 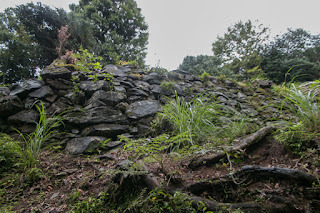 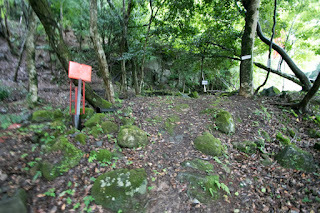 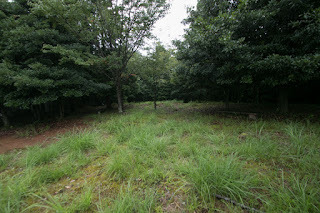 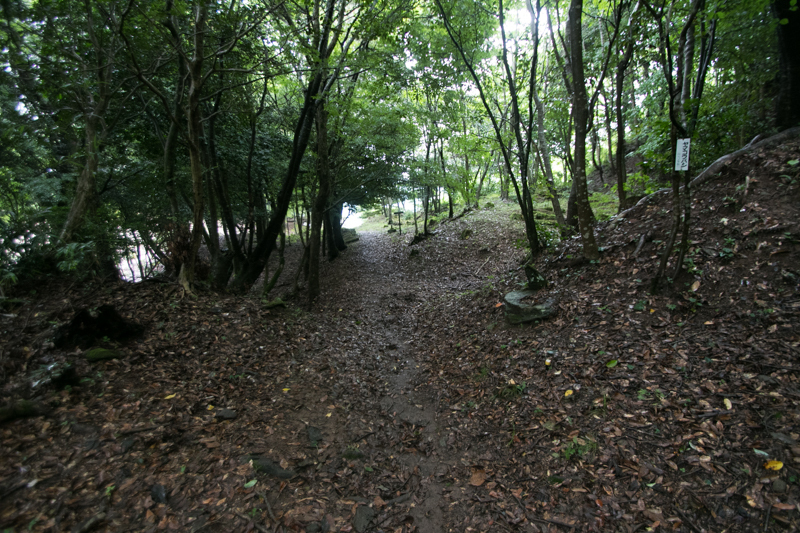 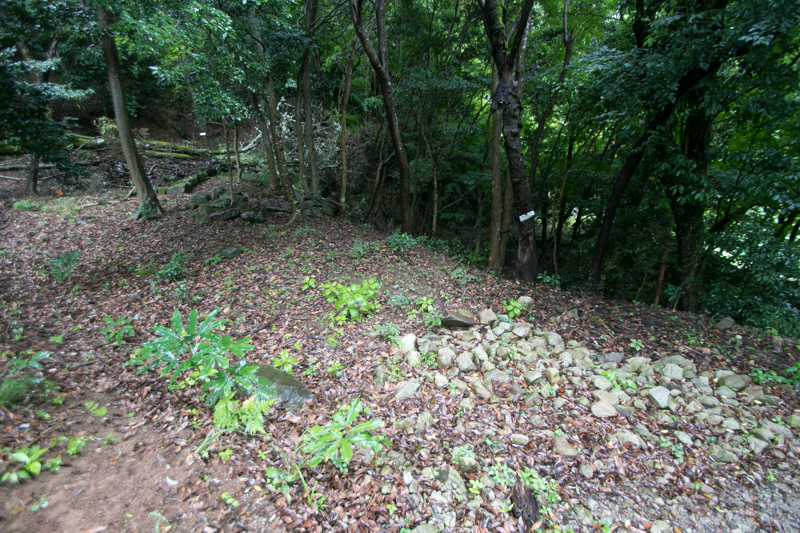 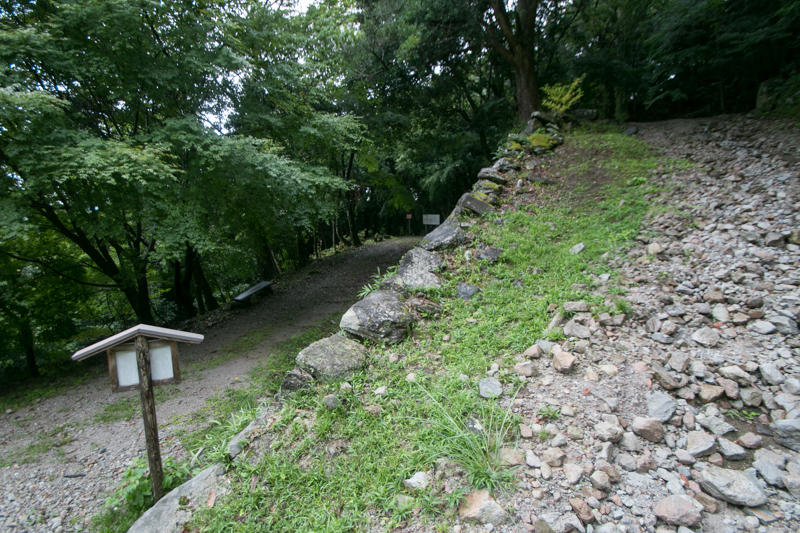 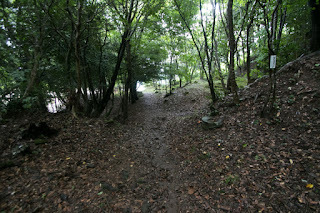 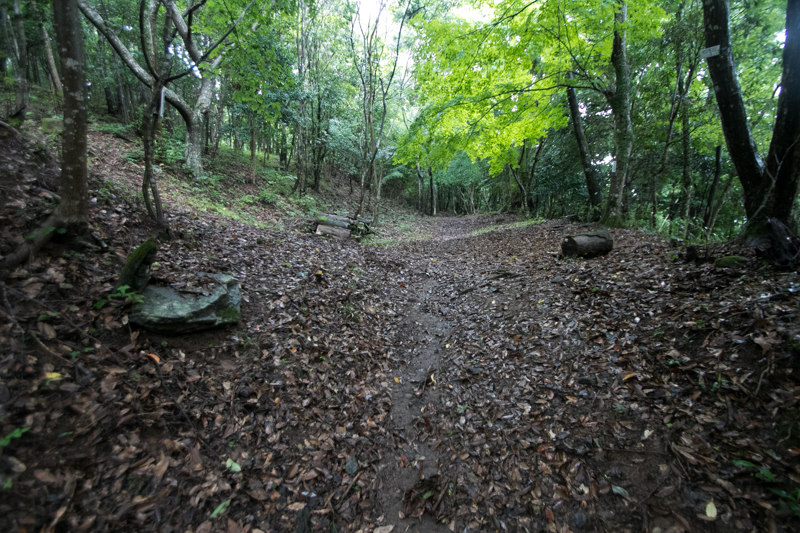 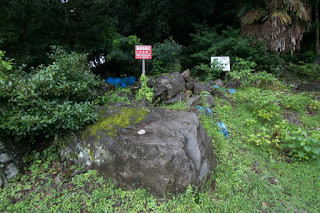 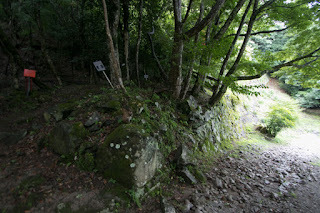 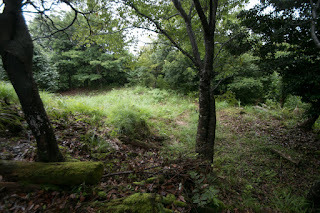 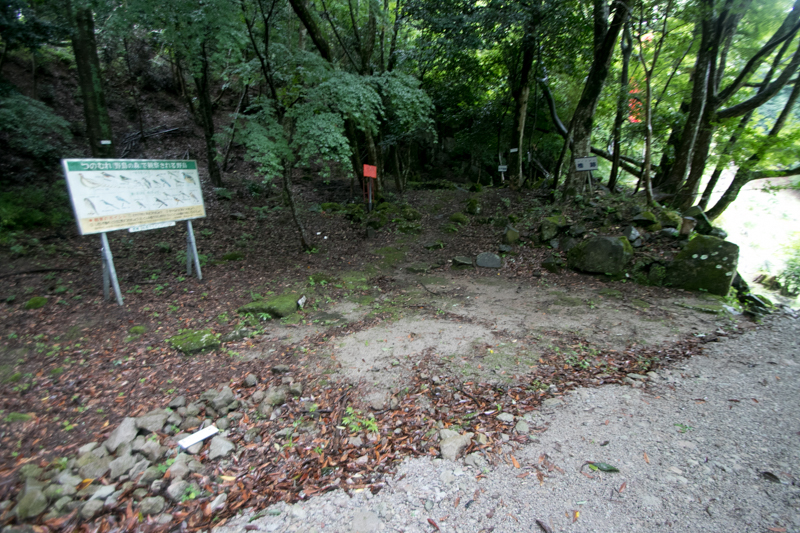 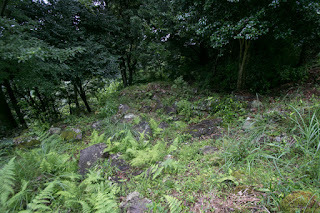 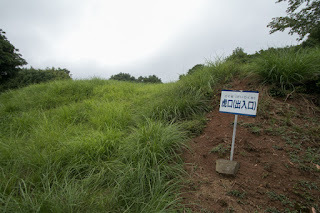 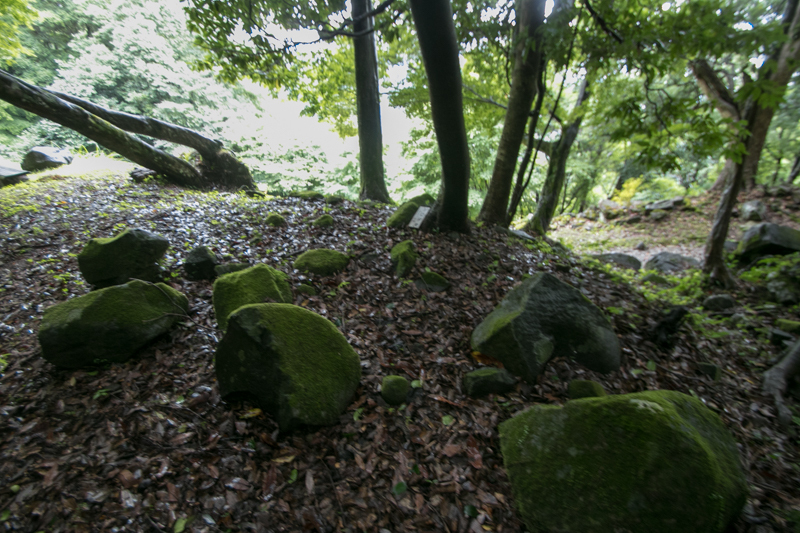 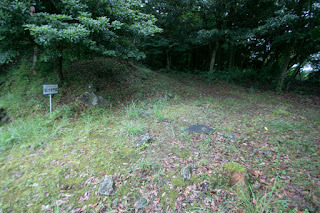 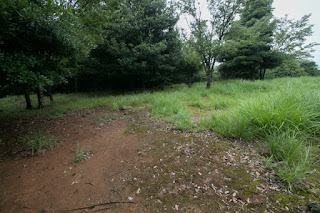 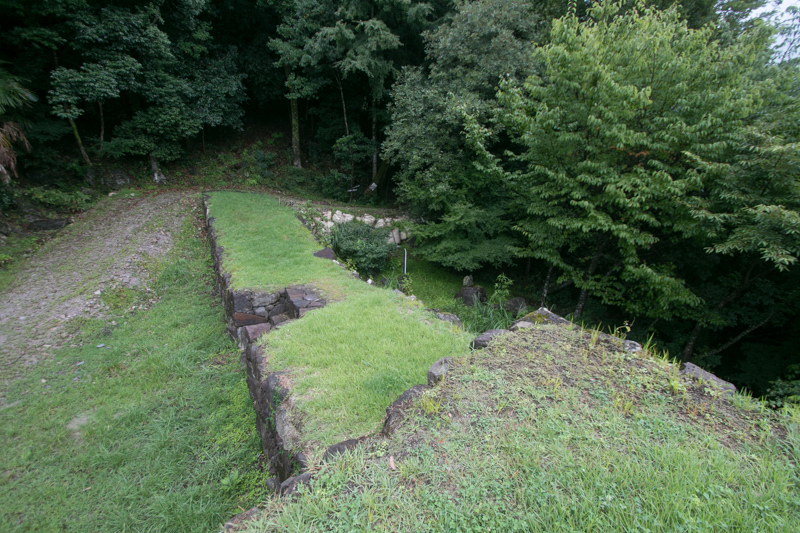 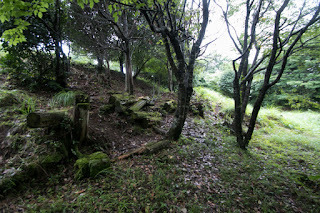 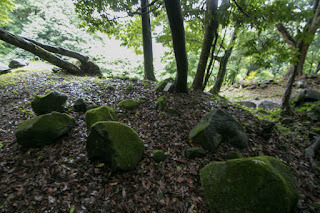 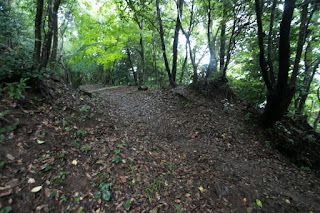 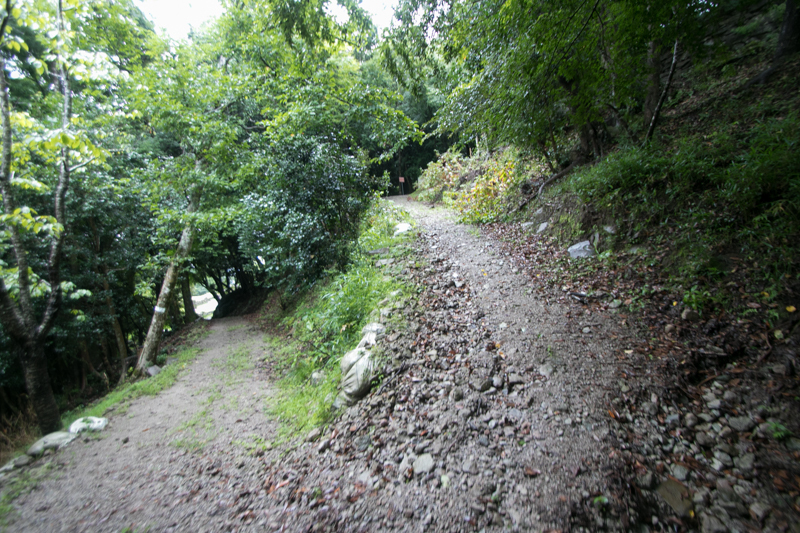 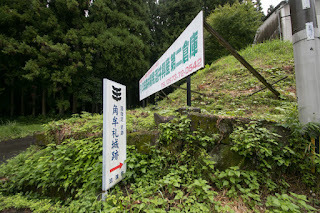 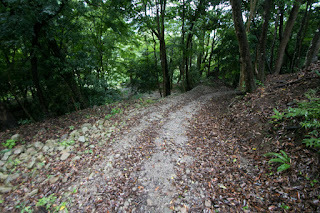 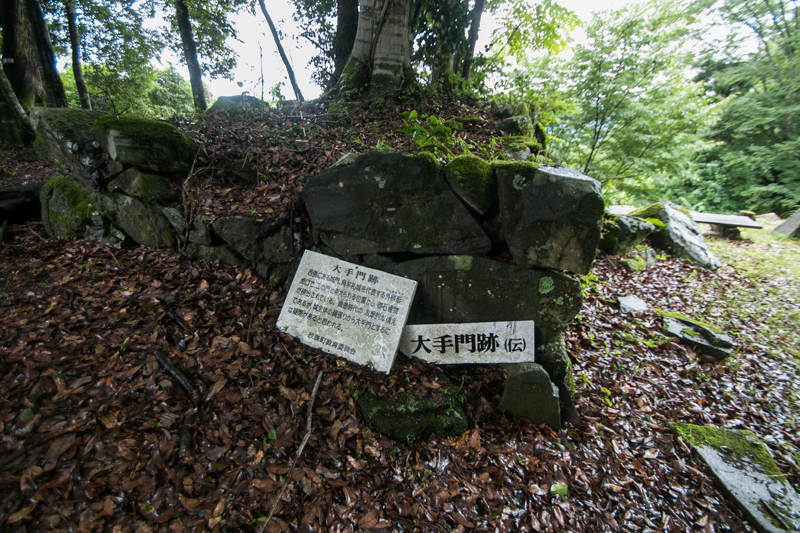 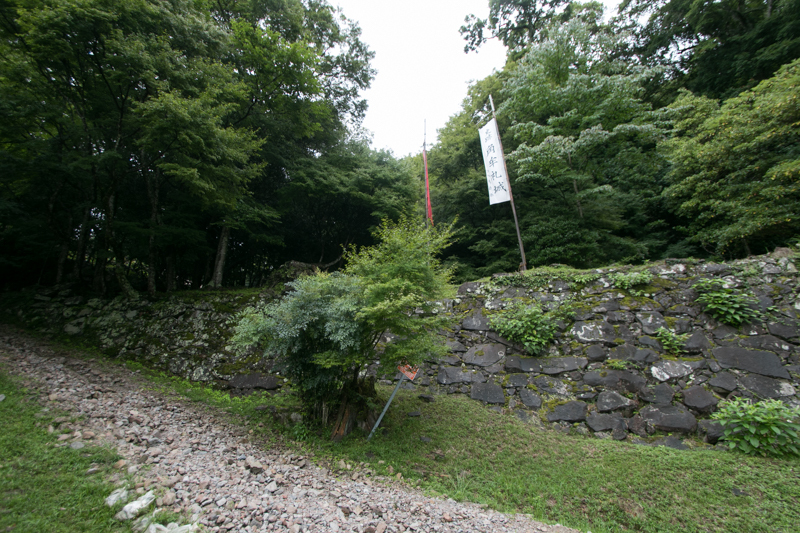 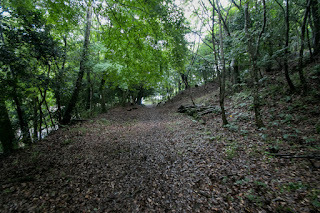 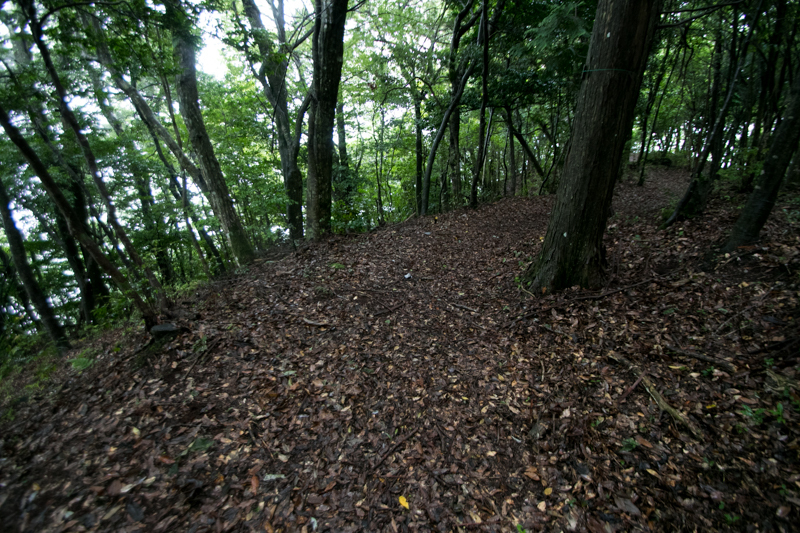 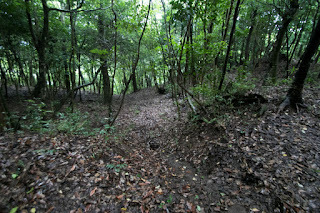 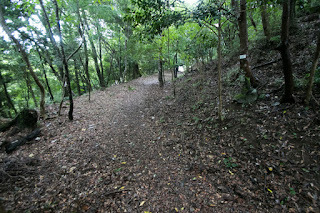 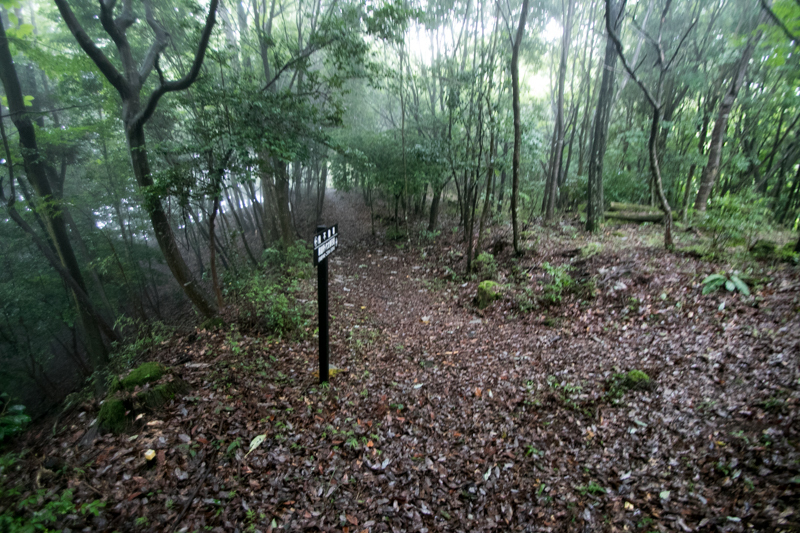 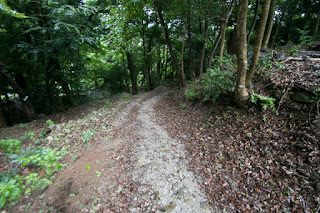 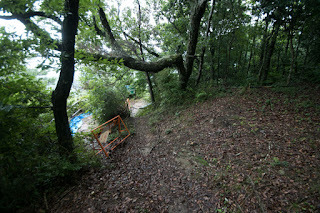 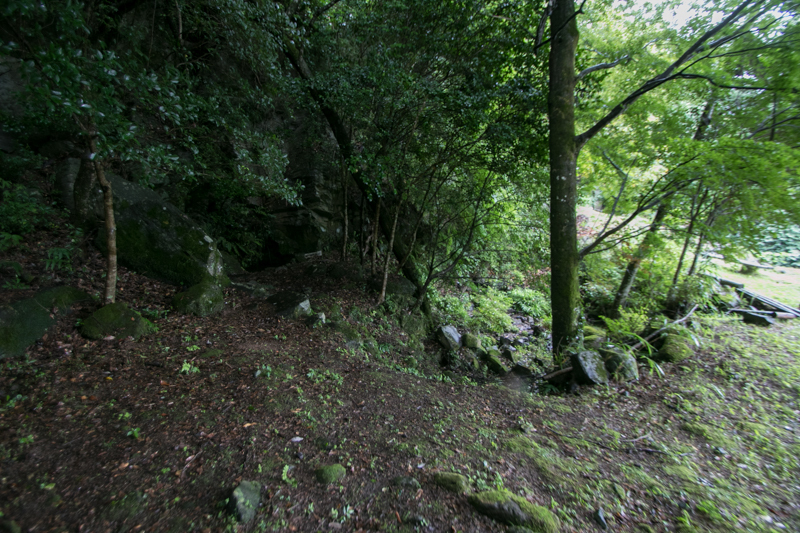 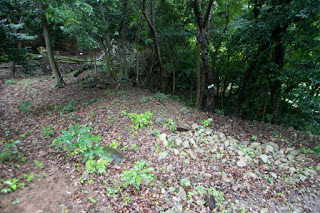 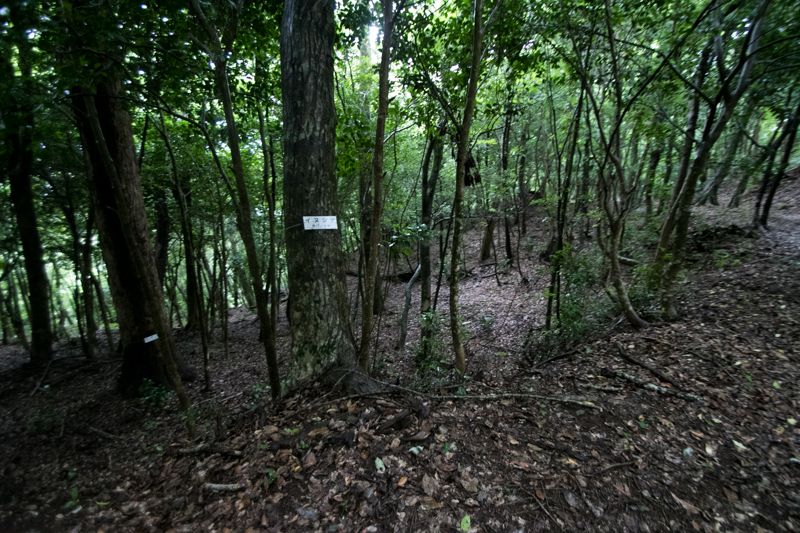 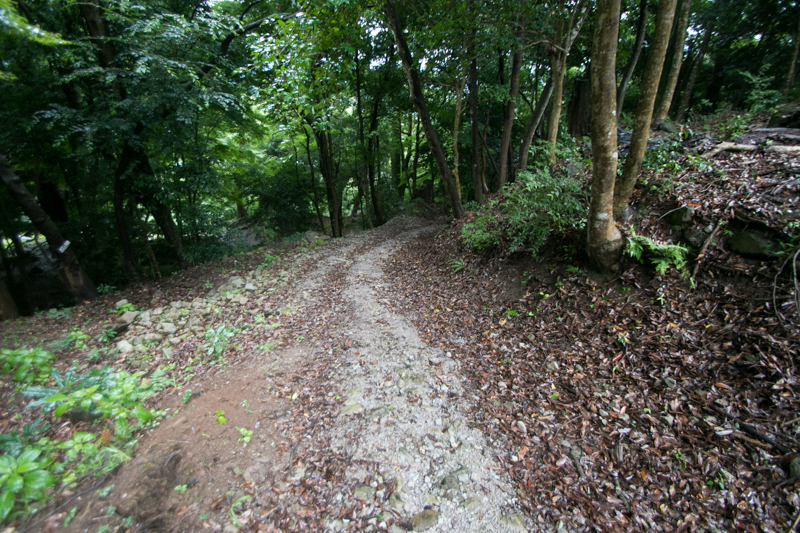 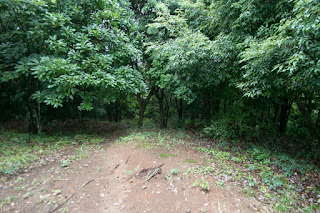 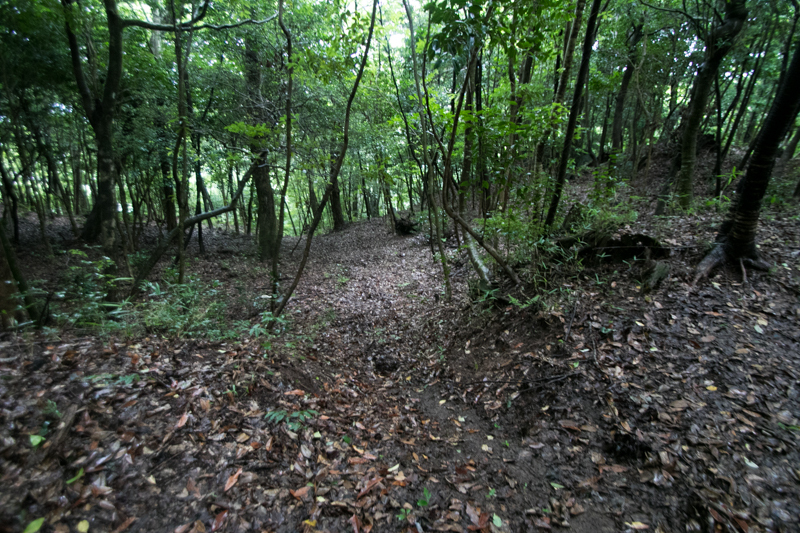 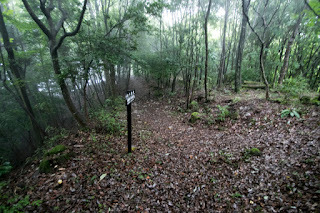 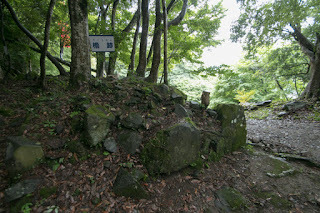 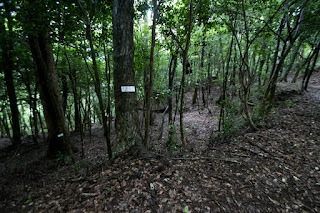 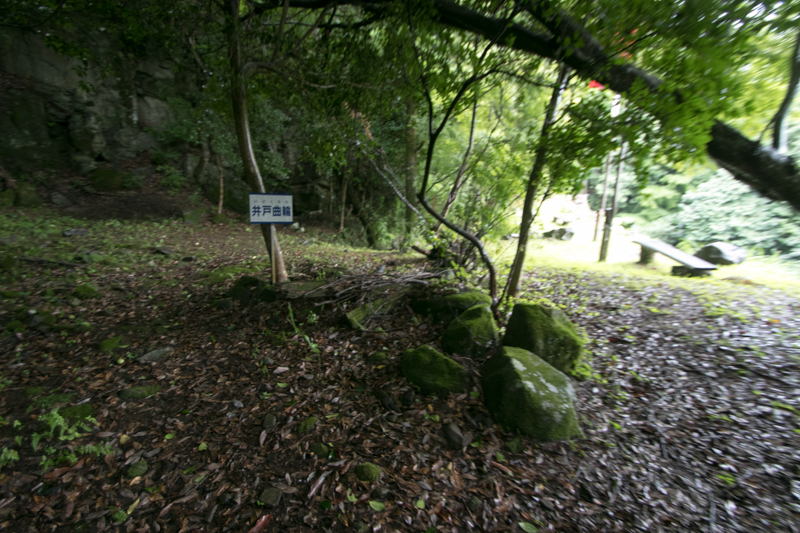 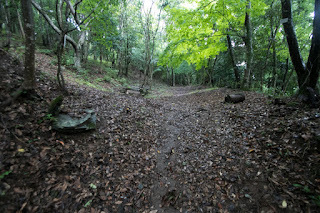 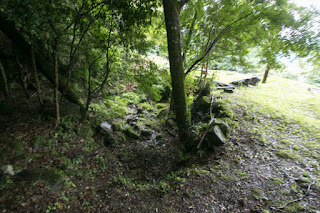 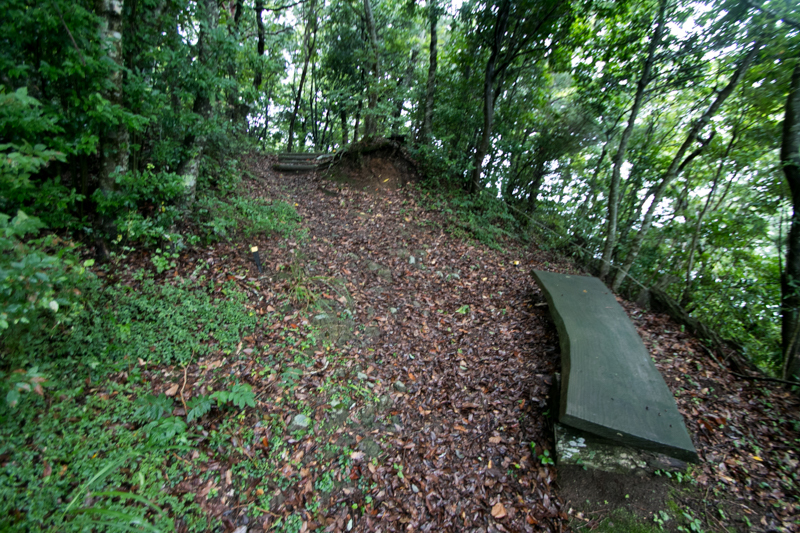 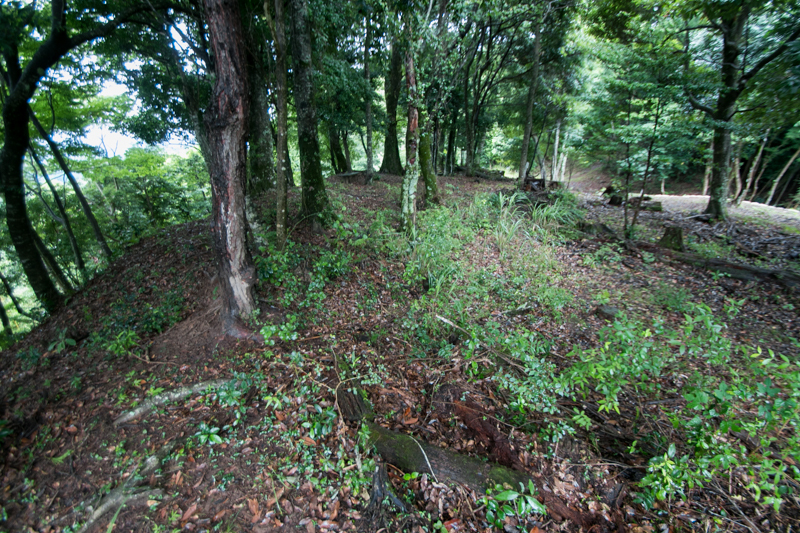 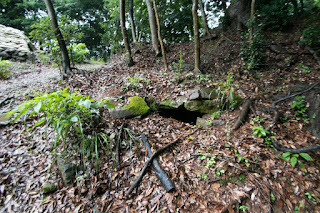 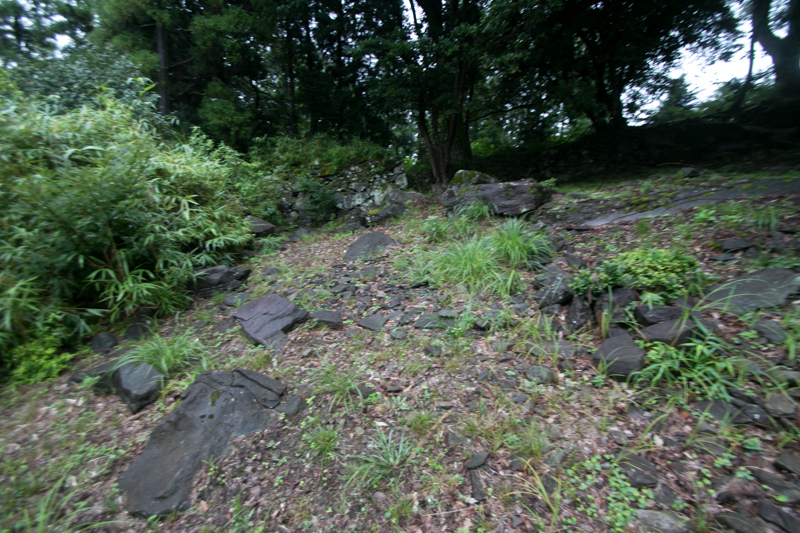 Entrance to castle site was banned by Kurushima clan thus castle site is comparatively kept well. 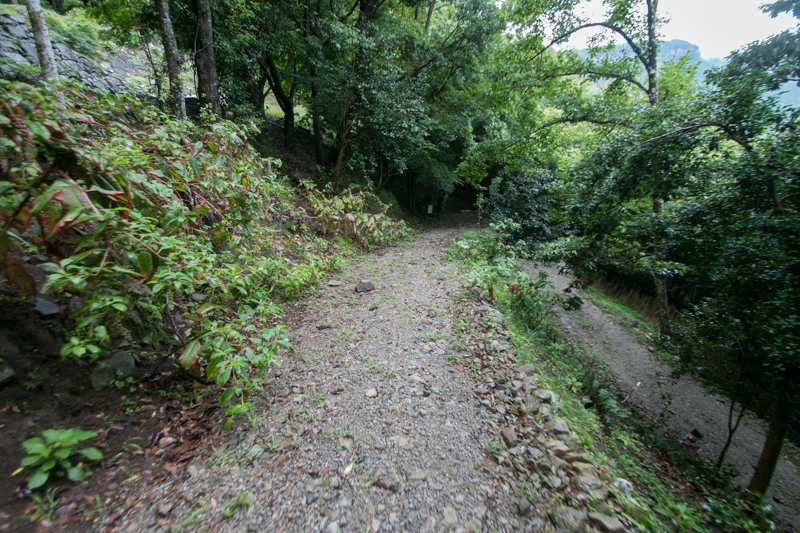 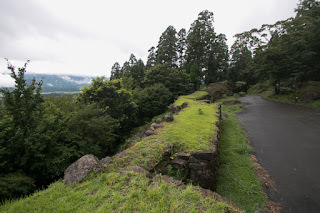 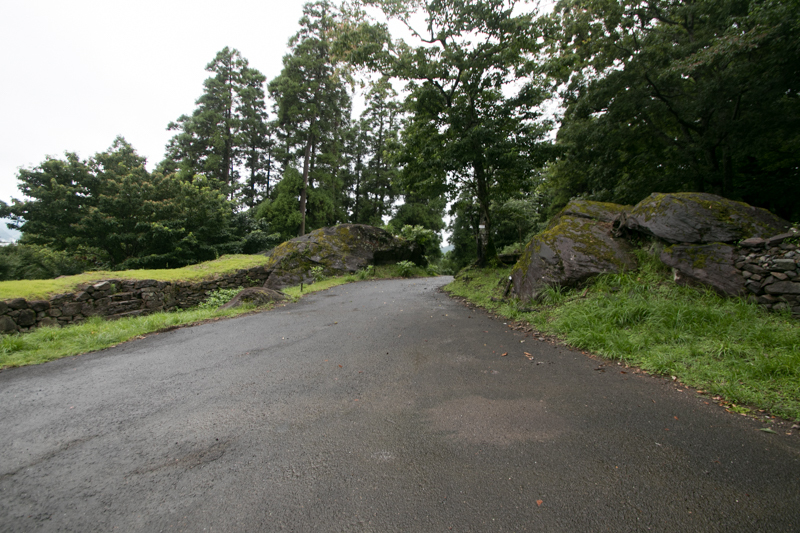 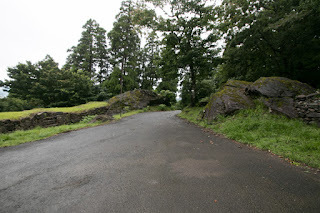 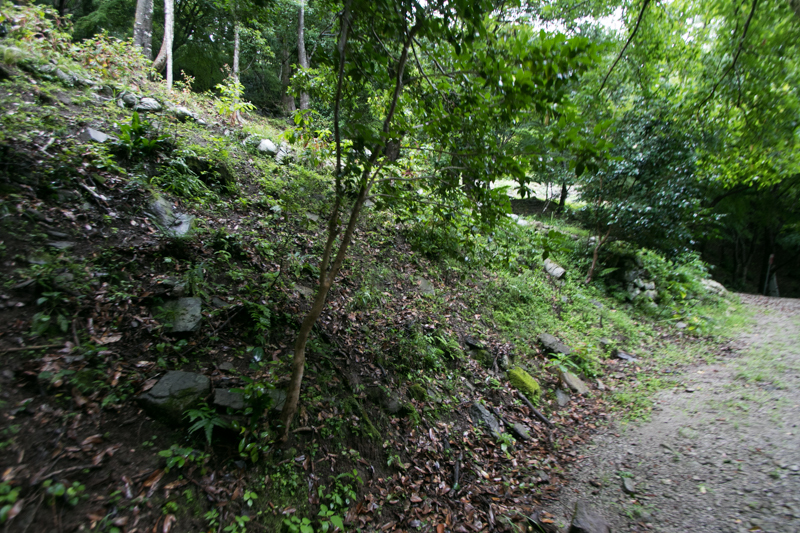 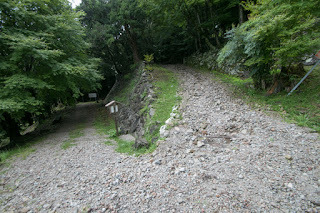 Now narrow car road directly connects from hillside to the third area, and in spite of its height visiting to this castle is not so difficult with car. 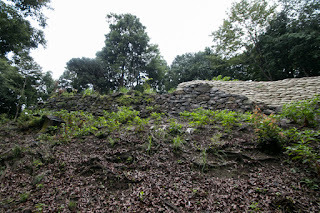 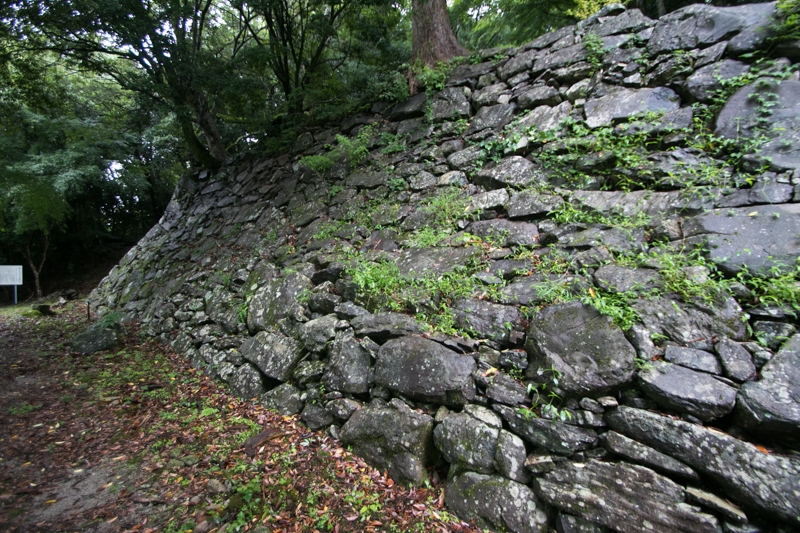 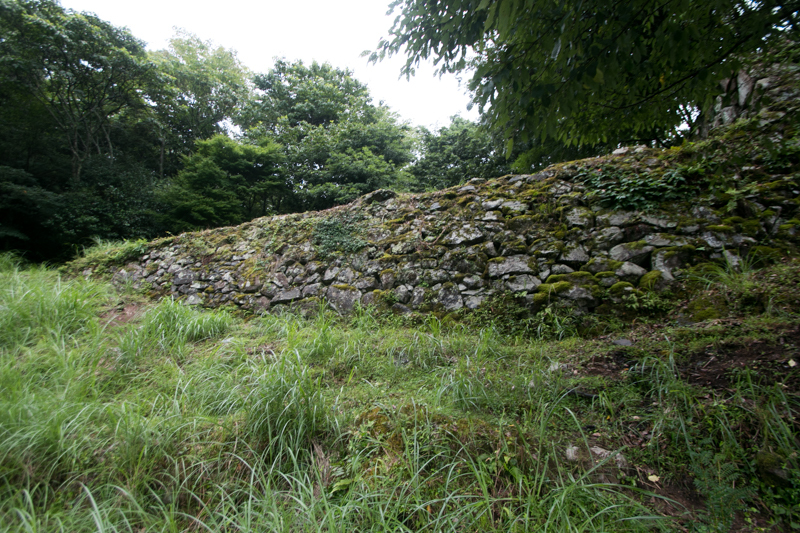 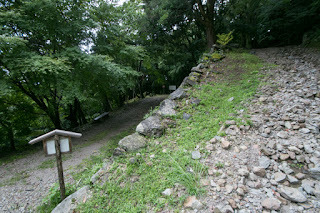 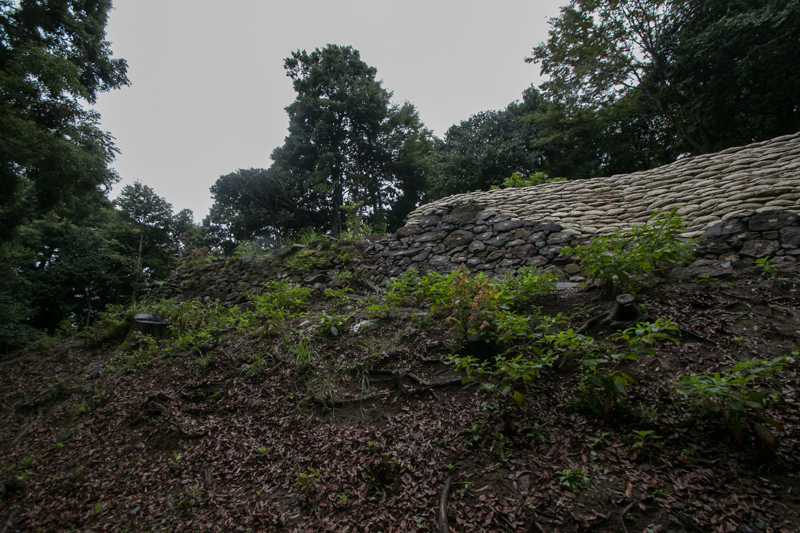 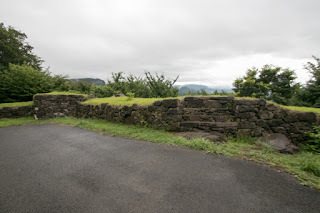 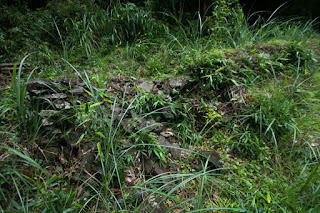 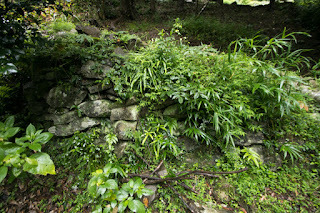 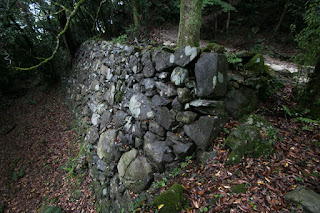 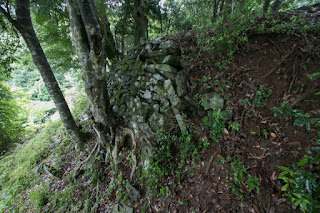 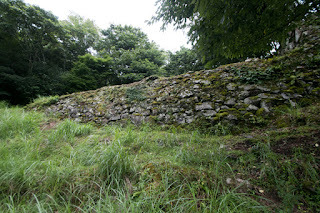 Stone walls of this castle is rough style and seems immature compared with Saeki castle built by Takamasa Mouri later. 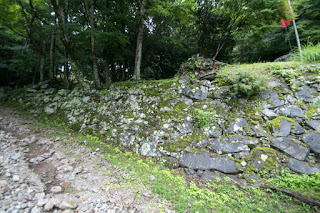 But time-worm stone walls spreads around different level heights have a gallant atmosphere, and shows it is an impregnable castle actually stood fierce attack of enemy. 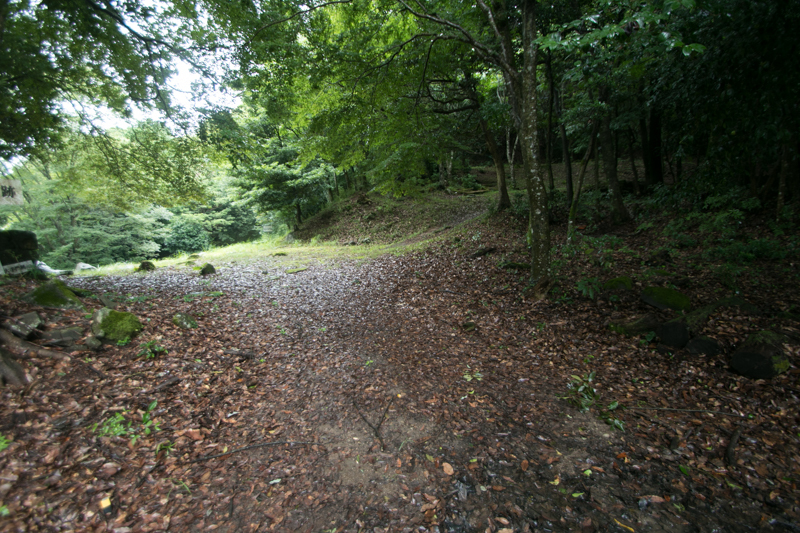 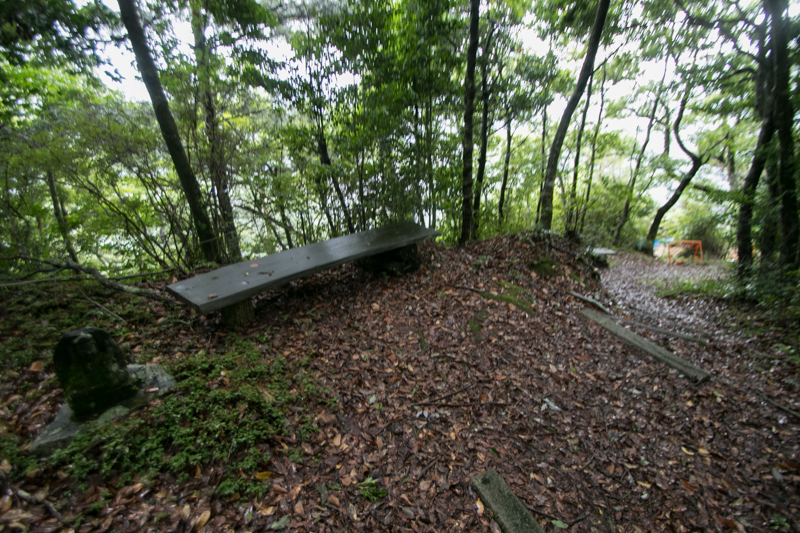 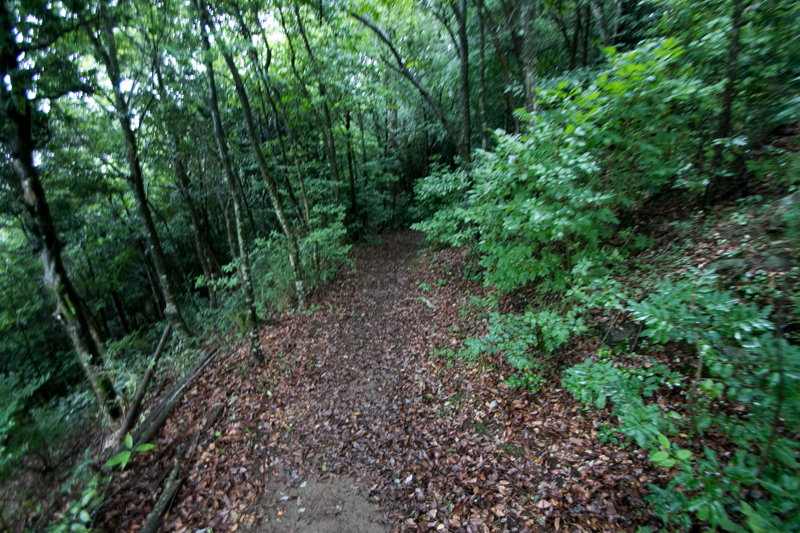 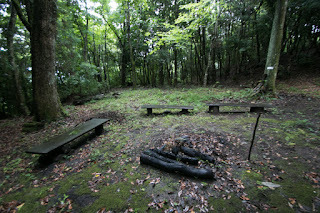 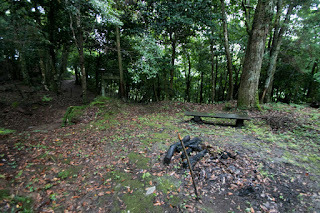 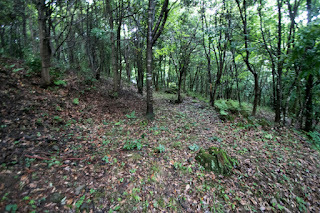 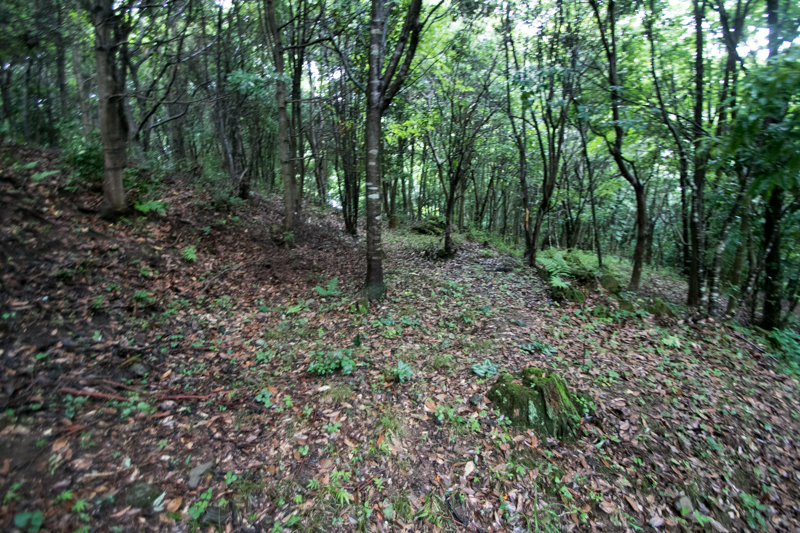 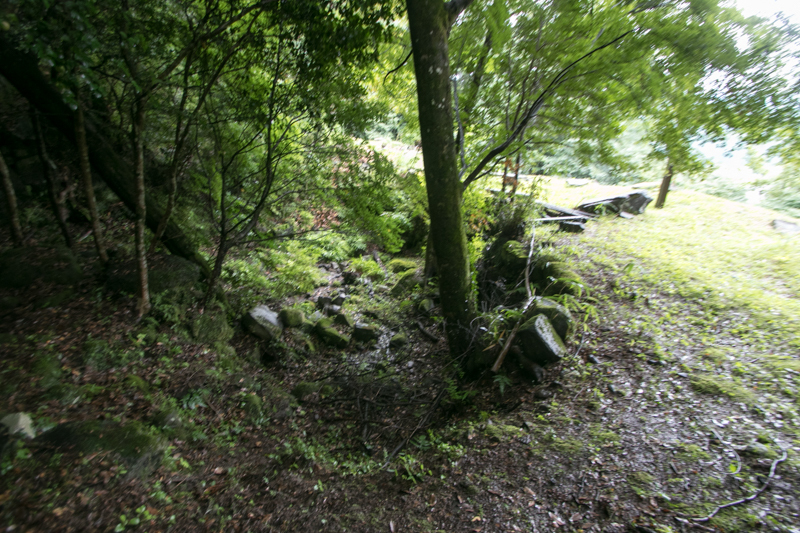 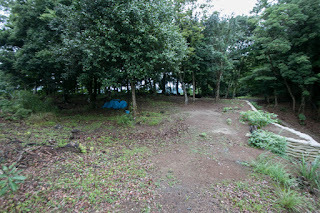 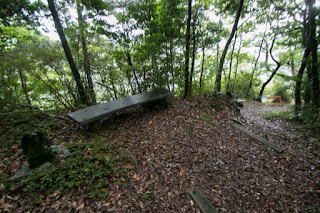 45 minutes walk from JR Kyushu Kyudai-Honsen line Bungo-Mori station. 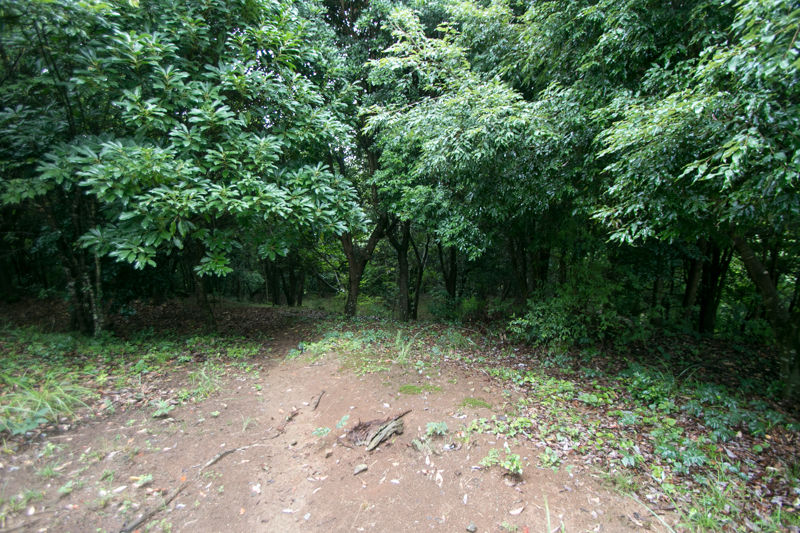 15 minutes drive from Oita Jidoshado Expressway Kusu interchange.